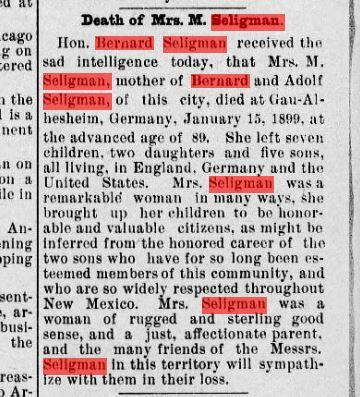 When I wrote the recent post about the news articles my cousin Wolfgang had found about our Seligman(n) relatives, I had forgotten that a month earlier Wolfgang had sent me some other items he’d found about our relative, James Seligman—brother of Bernard, my great-great-grandfather, and August, Wolfgang’s great-grandfather. Somehow that earlier email had gotten lost in the mess that is my inbox. My apologies to Wolfgang! 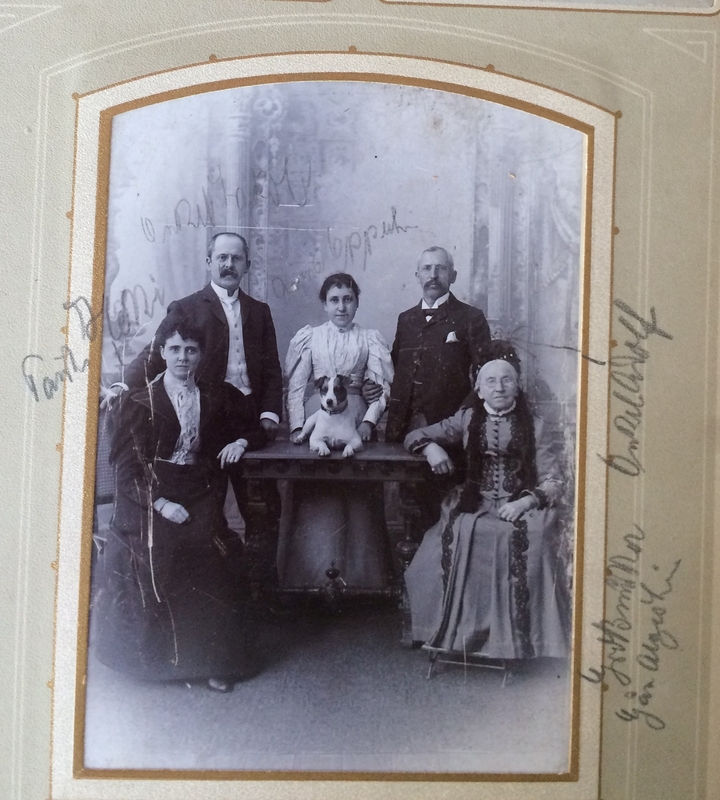 A little more background on James: He was the youngest child of Babette Schoenfeld and Moritz Seligmann, born in about 1853 in Gau-Algesheim. 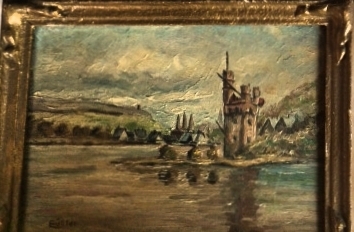 By the time he was 28 in 1881 he had immigrated England where he was a wine merchant in Kilpin, Yorkshire, in conjunction with his brothers August and Hieronymus, who were living in Germany. 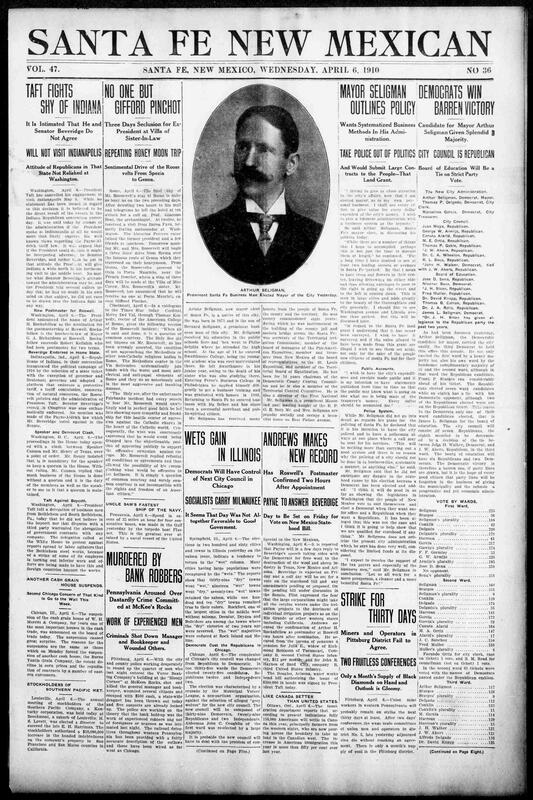 He took sole control over that business in 1891. 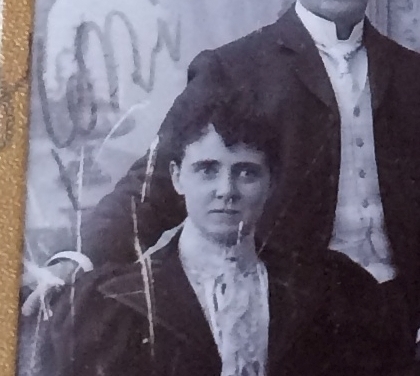 In 1887, James married Henrietta Walker Templeton in London. 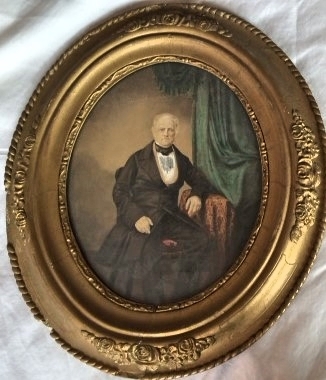 In 1901, they were living in Scotland, but by the 1920s they had returned to England and were living in Birmingham where he remained for the rest of his life. 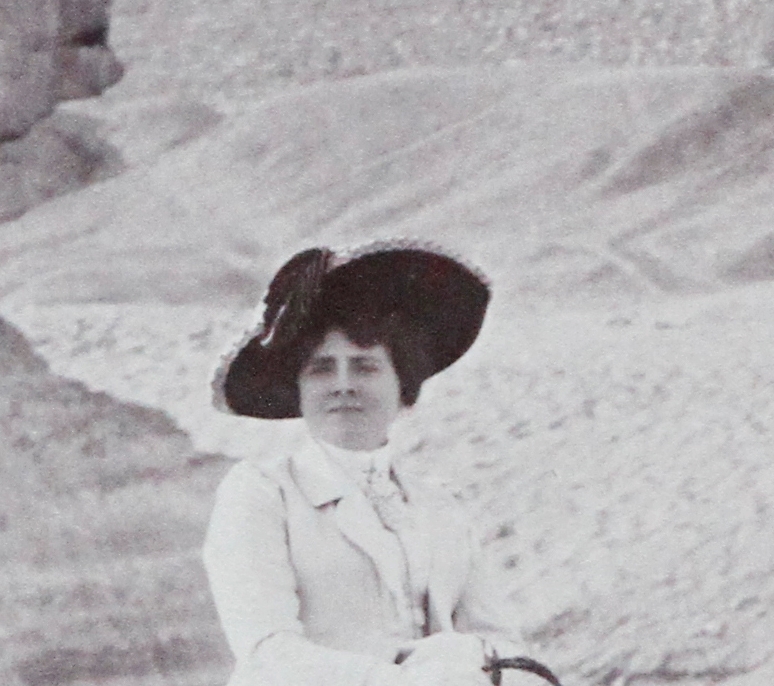 Henrietta died on October 4, 1928, and a year later in December 1929, James married his second wife Clara Elizabeth Perry. 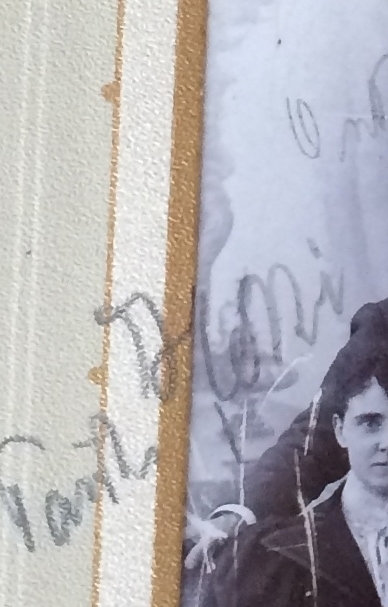 Clara was 45 years younger than James; she was 31 when they married, he was 76. 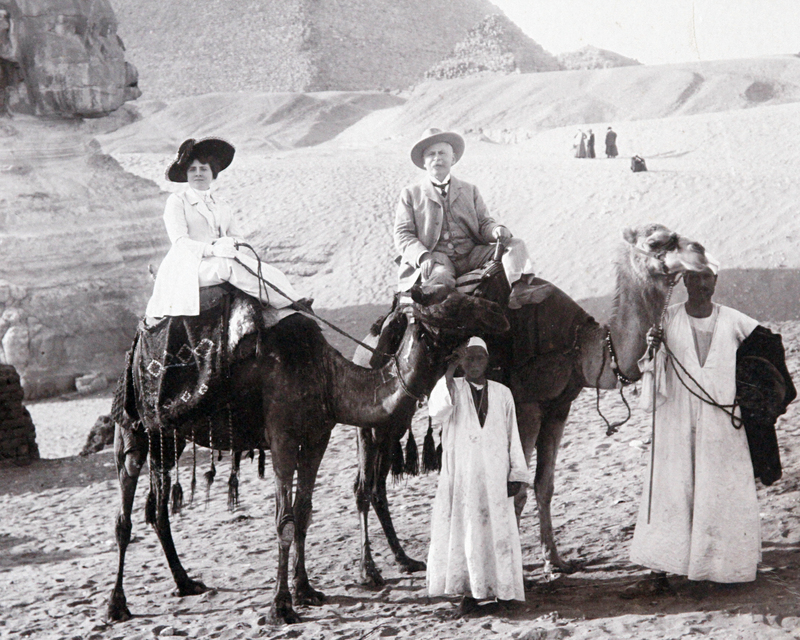 He died just three months after they married on March 11, 1930. 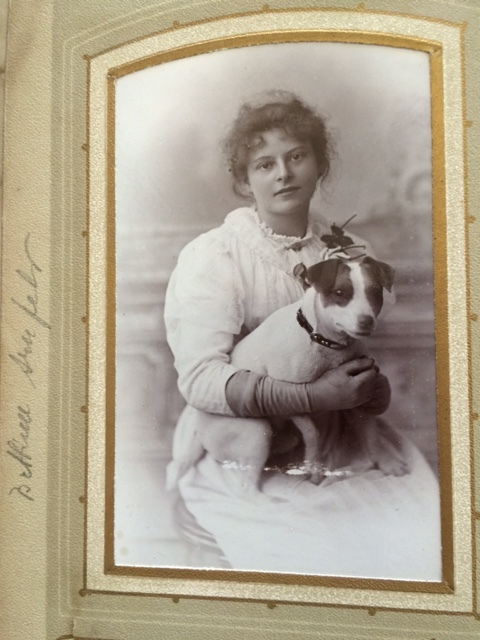 Clara remarried two years later and died in 1981. 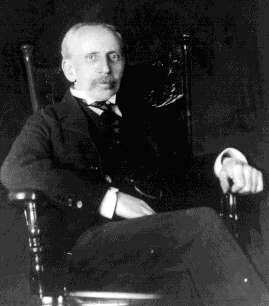 James did not have children with either of his wives. 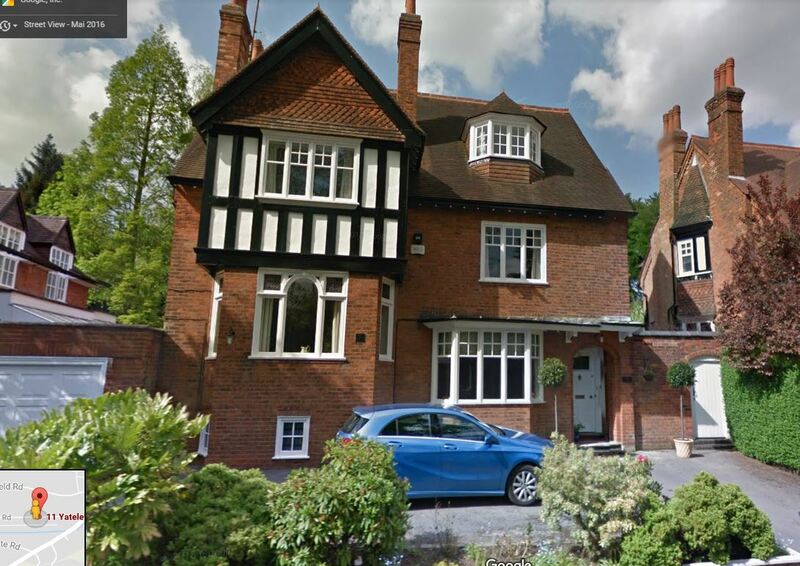 The death has occurred at the age of 77 of Mr. James Seligman, of 11 Yately-road, Edgbaston, Birmingham. 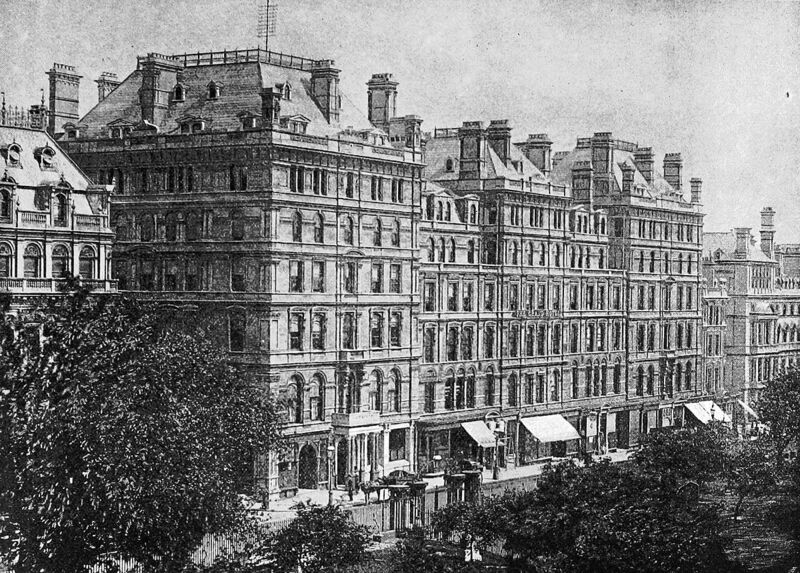 Formerly in business in Scotland, where he owned a number of hotels, Mr. Seligman was managing director of the Grand and Midland Hotels, Birmingham, and of the King’s Head Hotel, Sheffield. He was an expert on all business matters connected with hotel management, and was often consulted by proprietors and managers of hotel establishments in all parts of the country. 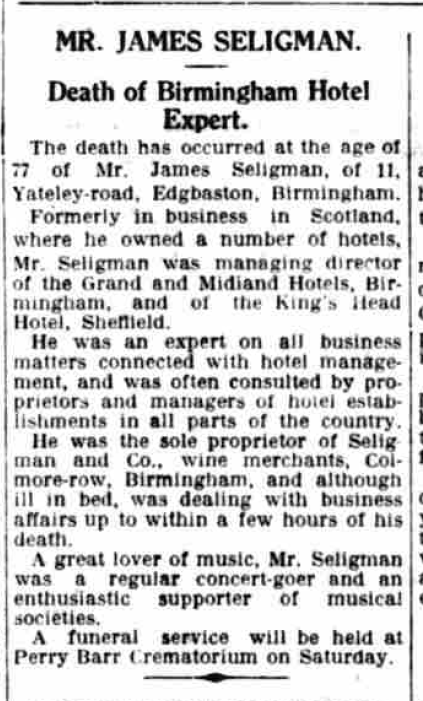 He was the sole proprietor of Seligman and Co., wine merchanges, Colmore-row, Birmingham, and although ill in bed, was dealing with business affairs up to within a few hours of his death. 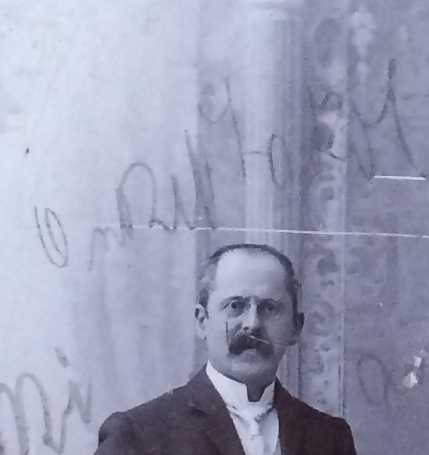 A great lover of music, Mr. Seligman was a regular concert-goer and an enthusiastic supporter of musical societies. A funeral service will be held at Perry Barr Crematorium on Saturday. 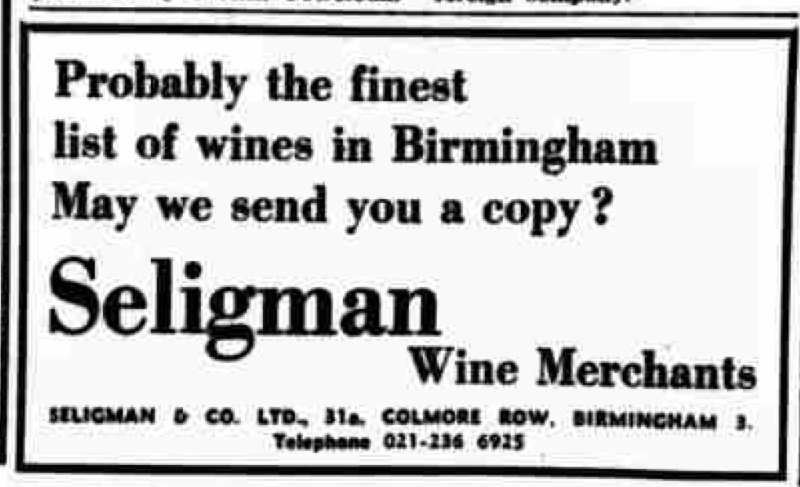 Interestingly, Wolfgang located an ad for Seligman’s Wine Merchants in the October 30, 1969, Birmingham Daily Post. 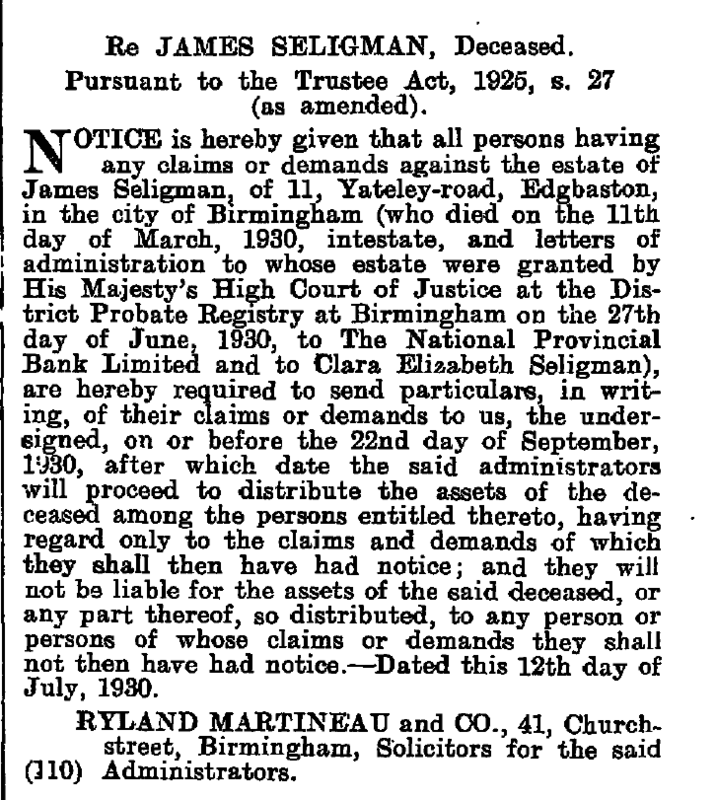 It was still located on Colmore Row in Birmingham and called Seligman’s almost forty years after James died in 1930. 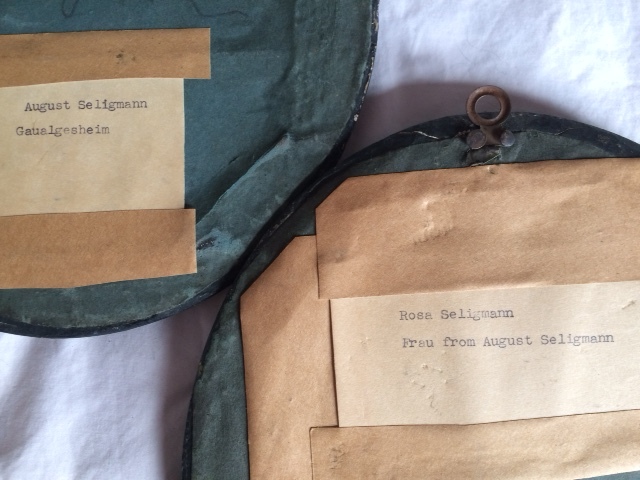 Thank you again to Wolfgang for sharing these items which shed more light on the personality and life of James Seligman, my three-times great-uncle and Wolfgang’s great-great-uncle. 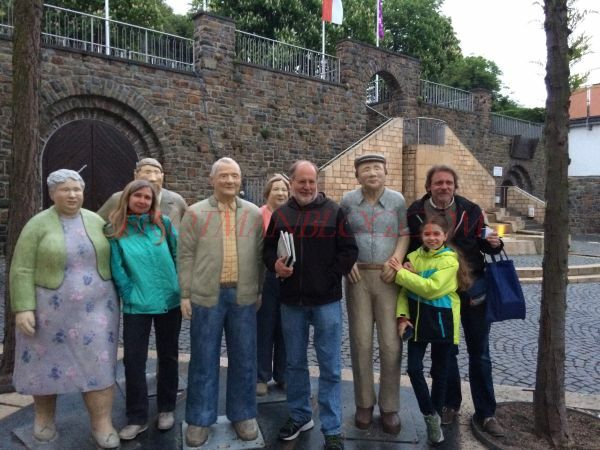 On our second night in Germany (May 3), we had a truly joyful and unforgettable experience: dinner with Wolfgang and his family—his wife Bärbel and their twelve year old daughter Milena. 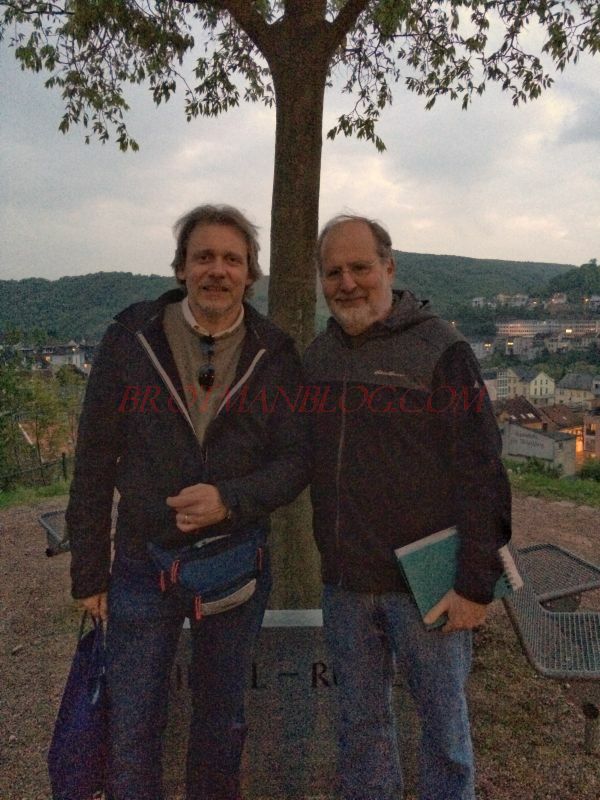 We met in the small town of Schwabenheim, located about halfway between Bingen, where we were staying, and Undenheim, where Wolfgang and his family live. I could not remember the name of the restaurant, but fortunately I was able to WhatsApp with Milena who told me it was zum Engel. 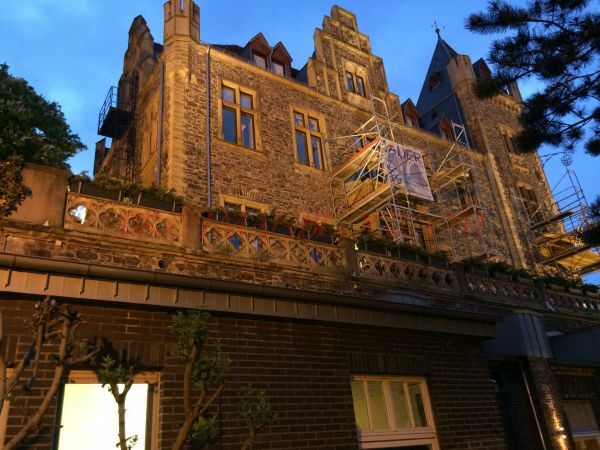 The atmosphere was perfect—an old stone building divided into smaller rooms with just a few tables. It was a good thing that for much of the time we had our room to ourselves because there was much laughter throughout our meal. 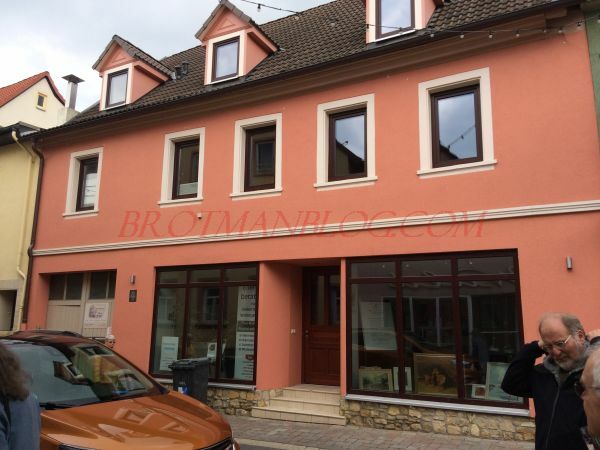 The following day Wolfgang, Harvey, and I traveled to Gau-Algesheim, the birthplace of my great-great-grandfather, Bernard Seligman, and of his younger brother August Seligmann, Wolfgang’s great-grandfather. 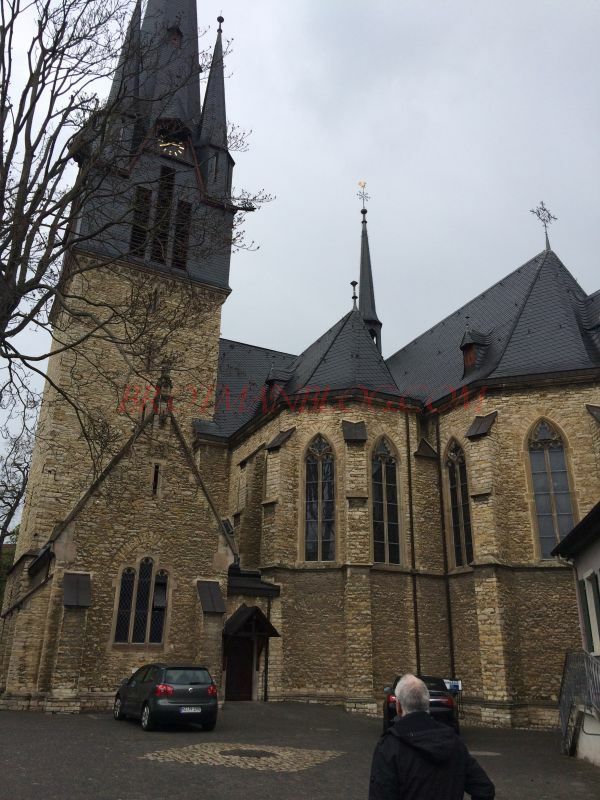 But first Wolfgang took us to see the Rochus Chapel outside of Bingen where his grandparents and father and uncle hid during the bombing of Bingen during World War II. 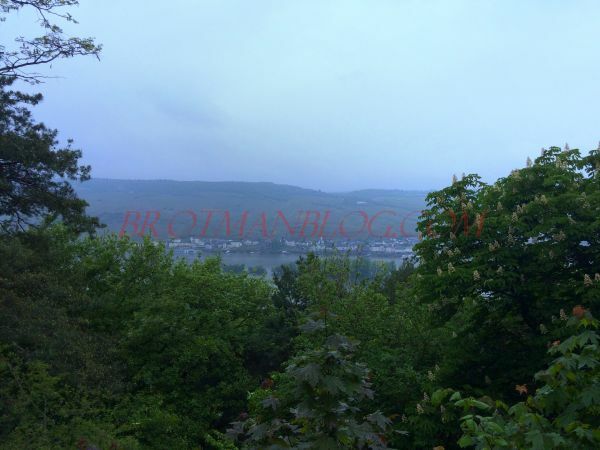 It is lovely church perched high above Bingen surrounded by trees and views of the valley and of the Rhine. 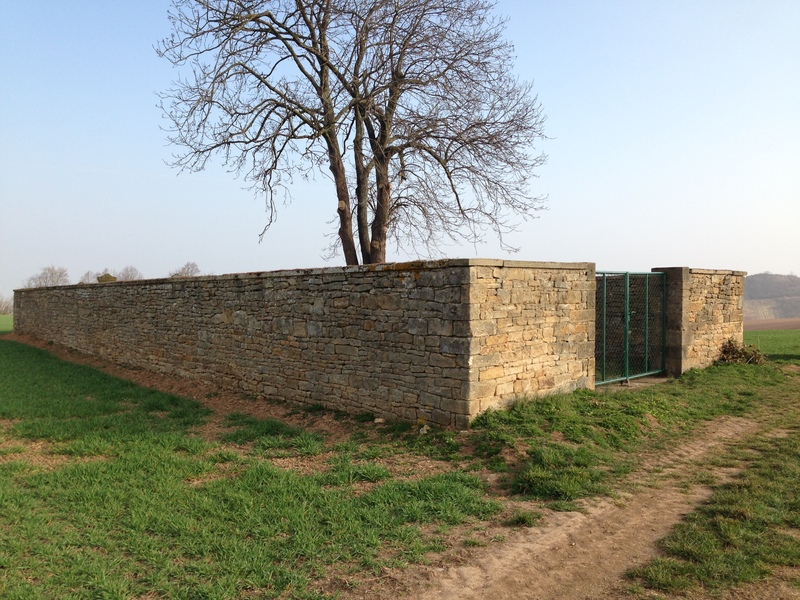 It was easy to see how this must have been a peaceful sanctuary for Wolfgang’s family and others during the bombing. In some ways the survival of Wolfgang’s grandfather, father, and uncle is a miracle. 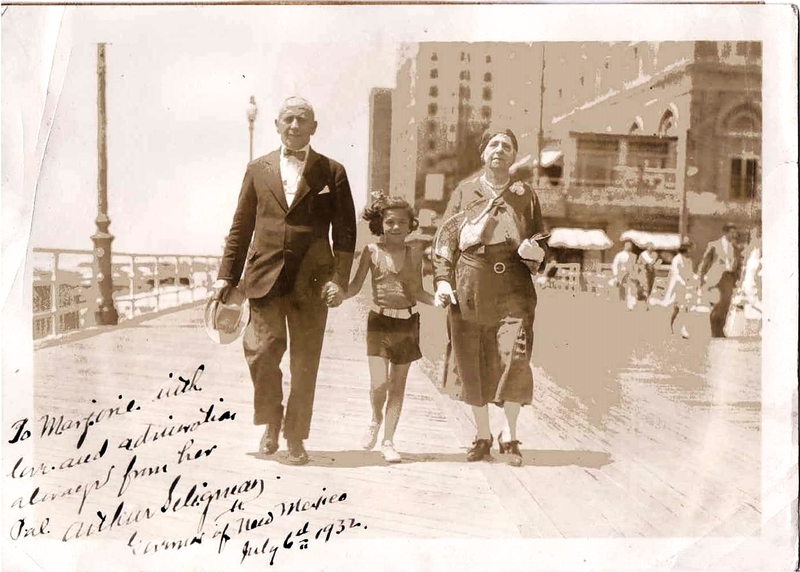 Julius Seligmann was born Jewish, but converted when he married Magdalena Kleisinger, who was Catholic. Their sons, Walter and Herbert, were raised as Catholics. But in Nazi doctrine, that should not have mattered. Julius had “Jewish blood,” and so did his sons. Many of those with Jewish ancestors who converted or who were raised as Christians were not spared from death by the Nazis. 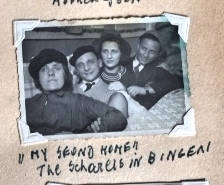 When I asked Wolfgang why he thought his grandfather, father, and uncle survived, he said that his mother always said that the Bingen Nazis were stupid. 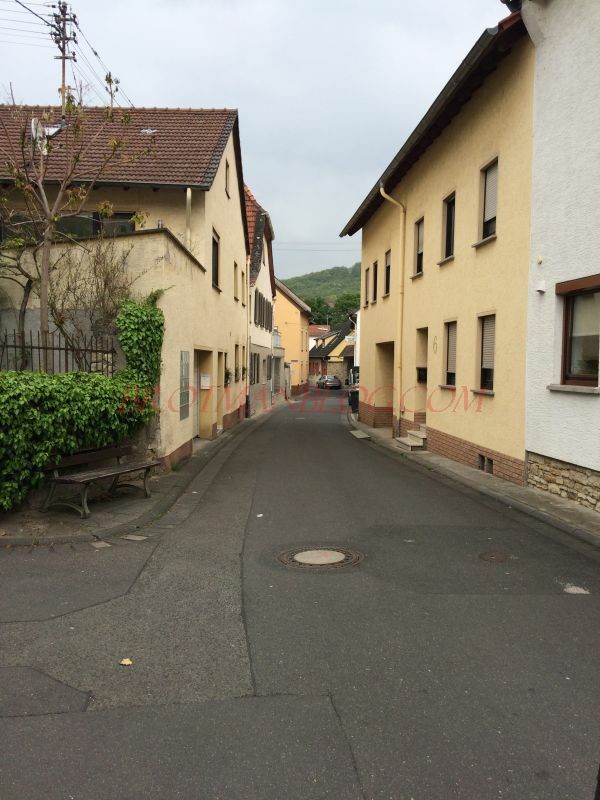 Or that perhaps the police in Bingen somehow provided protection. 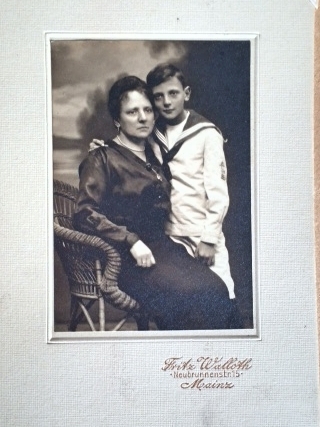 As I wrote earlier, Wolfgang’s father Walter did forced labor on the Siegfried Line during the war and there were restrictions placed on the men in terms of their occupations, but they were not deported or tortured. 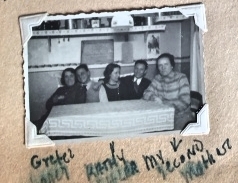 I am thankful for that; otherwise, my dear cousins Wolfgang, Bärbel, and Milena would not be part of my life. 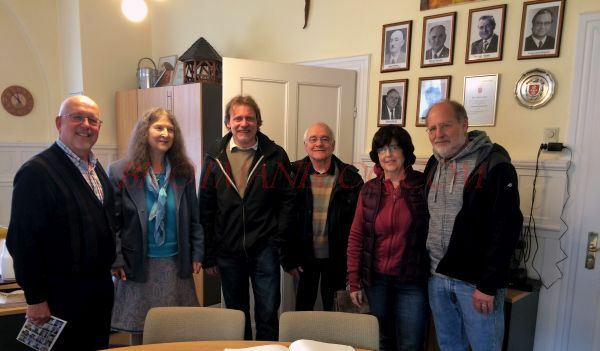 After leaving Rochus Chapel, we drove the short distance to Gau-Algesheim where we were to meet Dorothee Lottmann-Kaeseler, another German dedicated to preserving and honoring the history of the Jews in Germany. 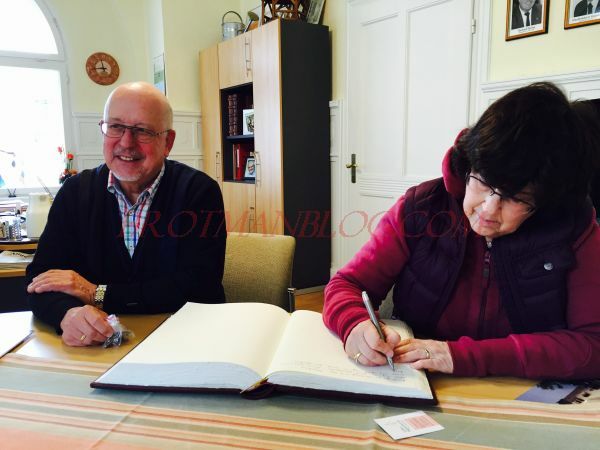 Dorothee and I had connected several years back through JewishGen.org when I was searching for information about Gau-Algesheim. 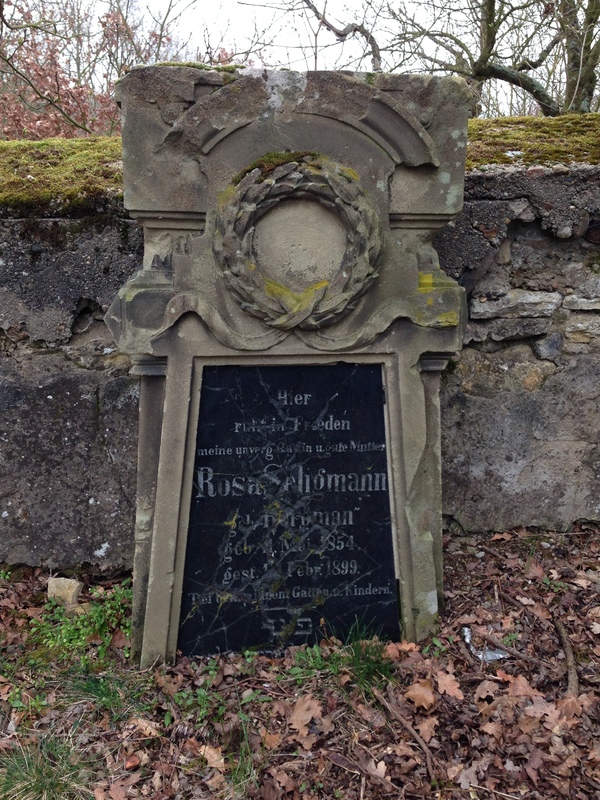 She had worked on a cemetery restoration project with Walter Nathan, a man whose father’s roots were in Gau-Algesheim; Walter and his family had escaped to the US in 1936. 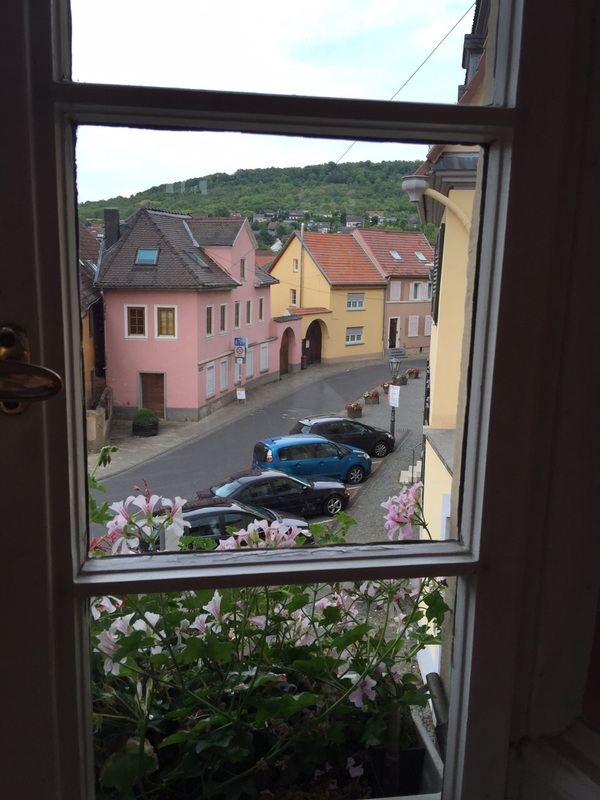 Dorothee and I have been exchanging information through email for several years—going far beyond my initial inquiries about Gau-Algesheim, and she is a regular reader and frequent commenter on my blog. I was very much looking forward to meeting this friend in person, and she is terrific—outgoing, energetic, interesting, smart, and very insightful. But it took some chasing to catch her! 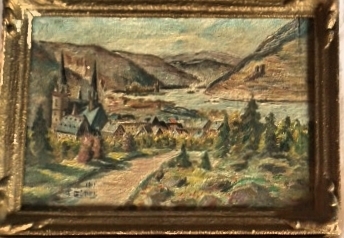 We drove up the road below the cemetery, and Wolfgang spotted what he believed was her car up on the hill near the cemetery gate. 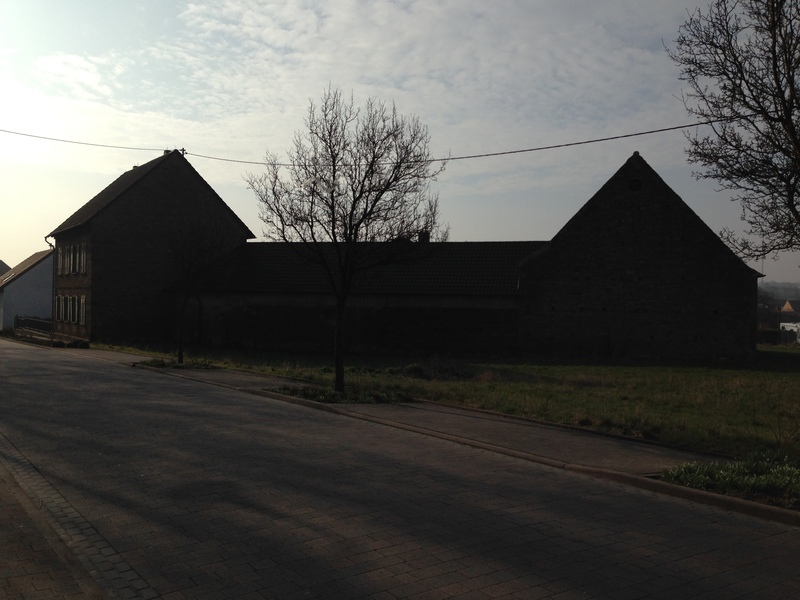 We got out of the car and clambered up the hill only to see that Dorothee’s car had disappeared. (We were a few minutes late arriving.) 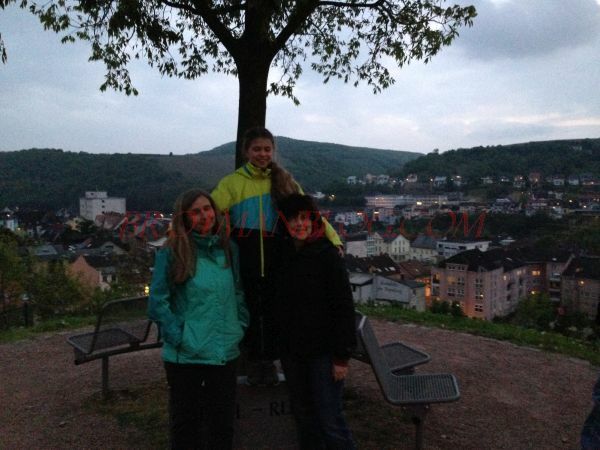 So we ran back down the hill, got in Wolfgang’s car, and raced back down the road where we again spotted Dorothee’s car. She had driven back down, thinking we might have missed her. It was like a scene out of a bad romantic comedy! Anyway, after introductions were made and hugs exchanged, we all drove back up to the cemetery gate. 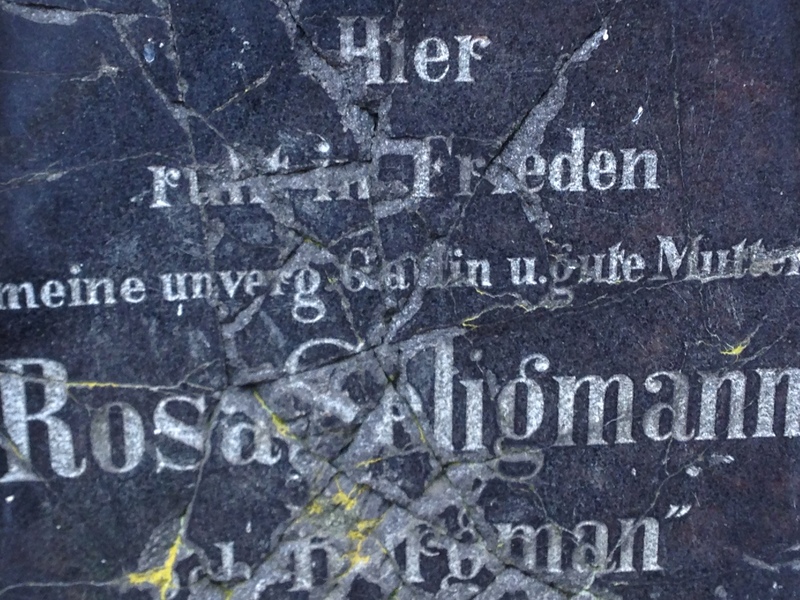 Dorothee was accompanied by a Gau-Algesheim resident named Manfred Wantzen, who had the key to the cemetery. 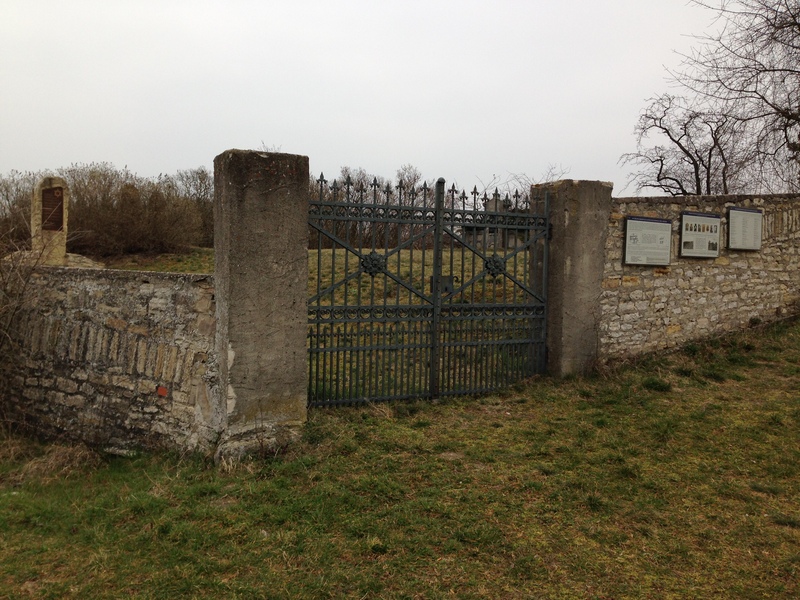 But before we entered, Dorothee reminded us that in fact there were very few stones in the cemetery. This was not an act of Nazi destruction; this was an act of stupidity on the part of a man in the 1983 who may have had good intentions. 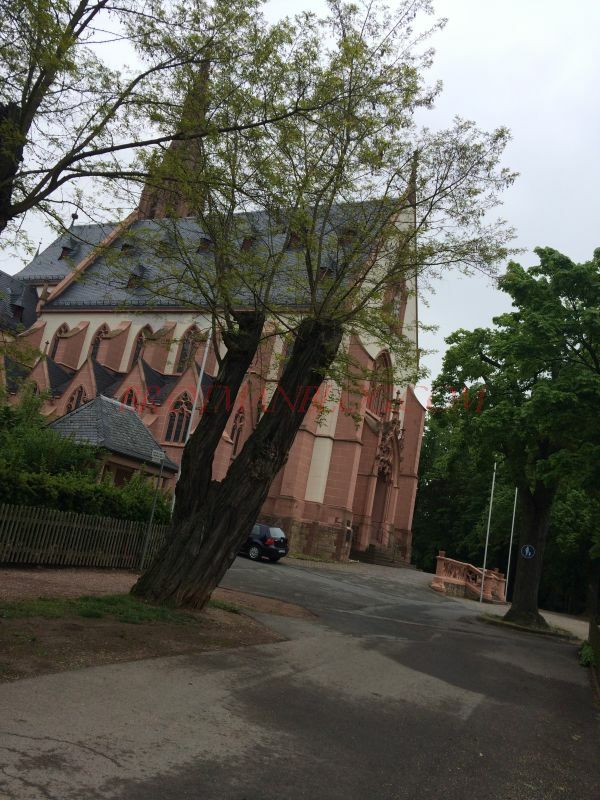 He thought the cemetery needed to be cleaned up and asked permission of the Jewish community in Mainz (which oversees the cemetery). They agreed without asking what he planned to do. The man then proceeded to remove the stones so he could cut the grass. 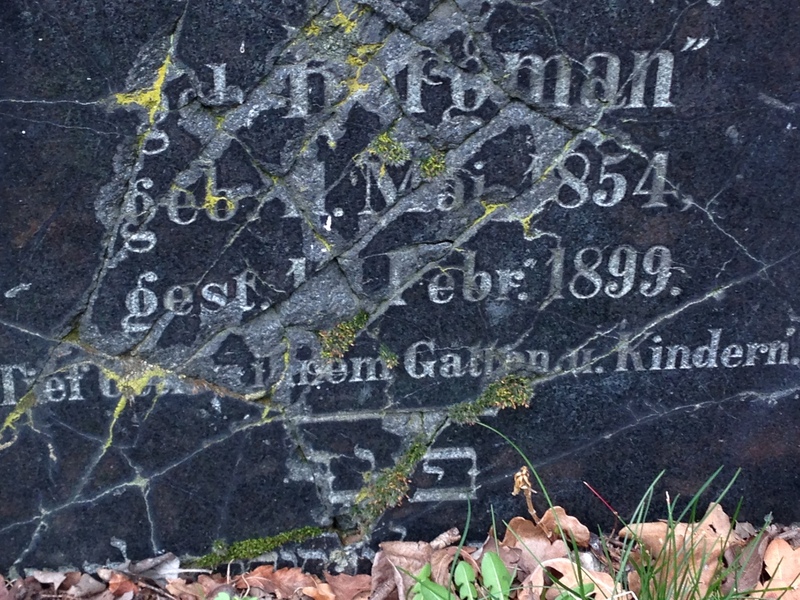 Some he placed against the cemetery wall, but others were carted away and lost forever. 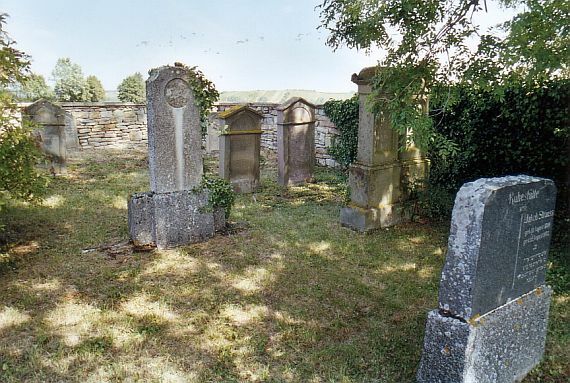 The Gau-Algesheim cemetery—with stones removed. When Dorothee and Walter Nathan worked to preserve what was left of the cemetery, several plaques and markers were placed on the wall outside and inside the cemetery, one to commemorate those who were killed in the Holocaust and others to honor the memory of those who were buried in the cemetery but whose stones were no longer there. 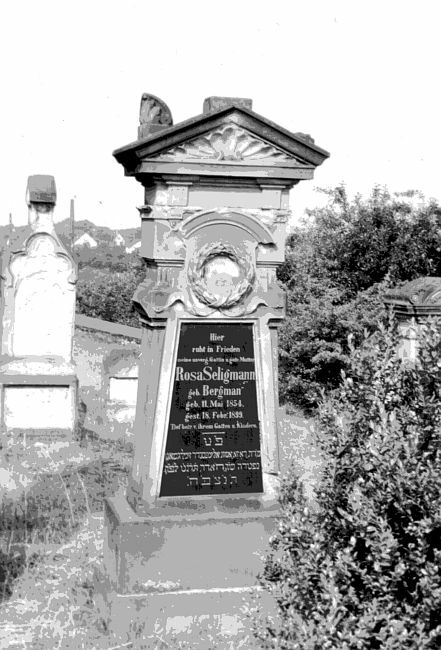 Unfortunately, there were no stones to be found for my 3-x great-grandparents, Moritz Seligmann and Babetta Schoenfeld, who were undoubtedly buried in that cemetery. 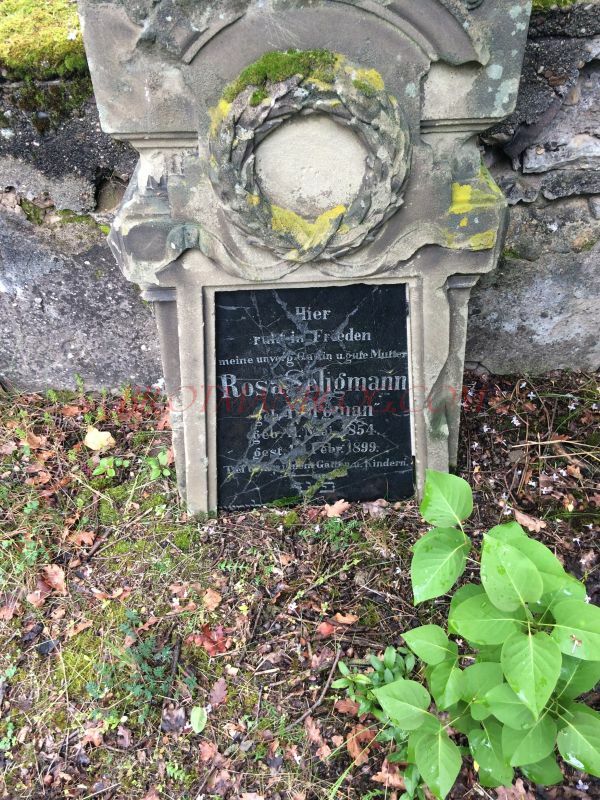 There were likely many other relatives buried there, including Wolfgang’s great-grandfather August Seligmann, but the only family member whose stone survived is that of Rosa Bergmann Seligmann, August’s wife and Wolfgang’s great-grandmother. But even that discovery was bittersweet as her stone had been vandalized several years ago by some local teenagers. Wolfgang and I each placed a stone on her grave to mark that we had been there and to honor her and all the other Seligmanns buried there. 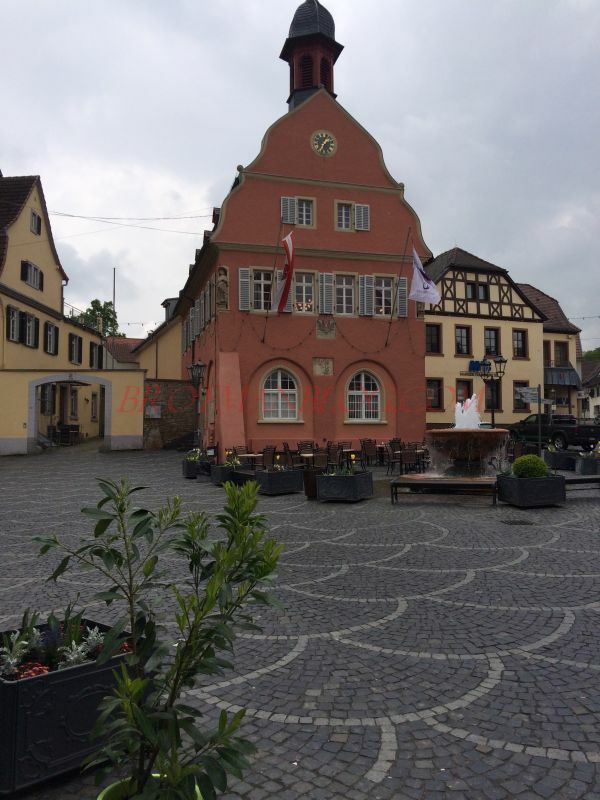 Dorothee had arranged for us to meet with the mayor of Gau-Algesheim, Dieter Faust. 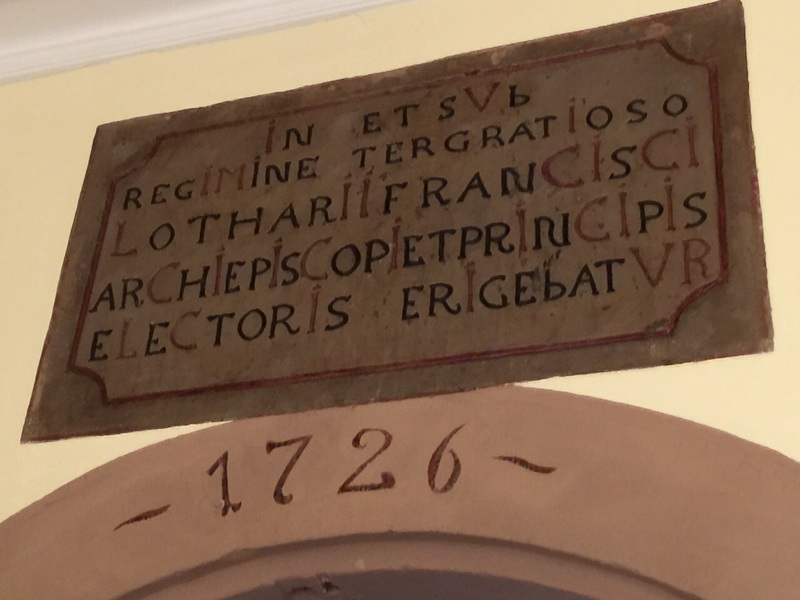 We sat in his office where everyone but Harvey and I spoke rapid German. I tried to understand, but it was futile. 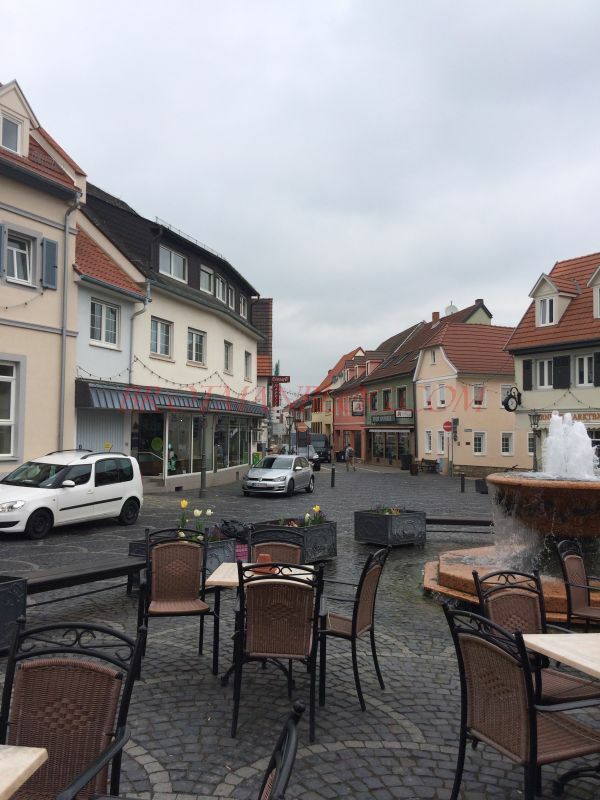 The mayor was extremely engaging and clearly excited to have two descendants of Gau-Algesheim residents visiting, and after signing his guest book and taking photographs, we all went to lunch—in an Italian restaurant in the middle of this small German town. And it was excellent! 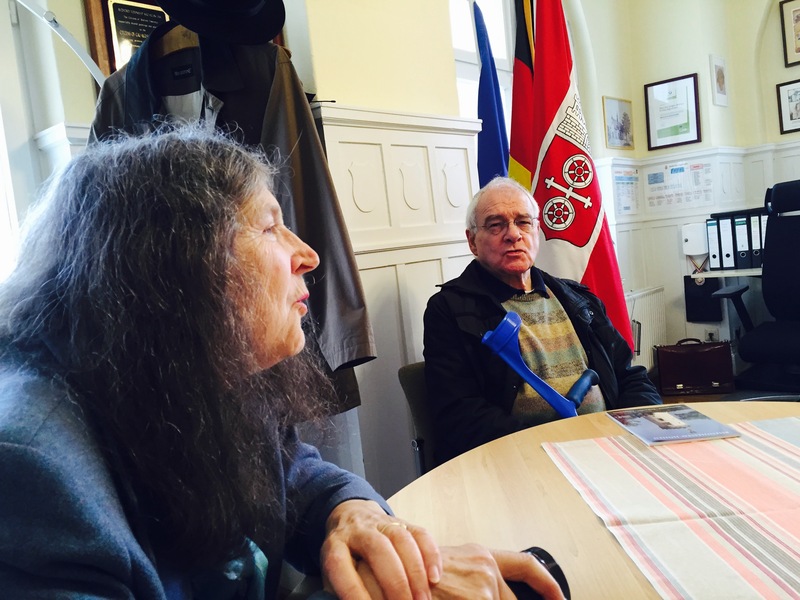 Somehow we all managed to converse and even managed to discuss American, French, and German politics with Dorothee and Wolfgang acting as interpreters. It was a delightful experience. 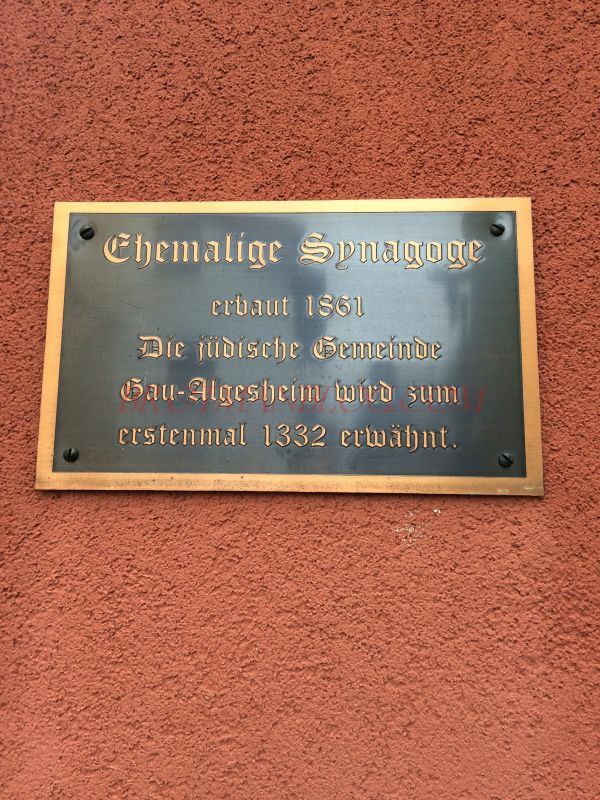 After lunch, Herr Wantzen and Dorothee guided us through the small town where we saw what had once been the synagogue in Gau-Algesheim. 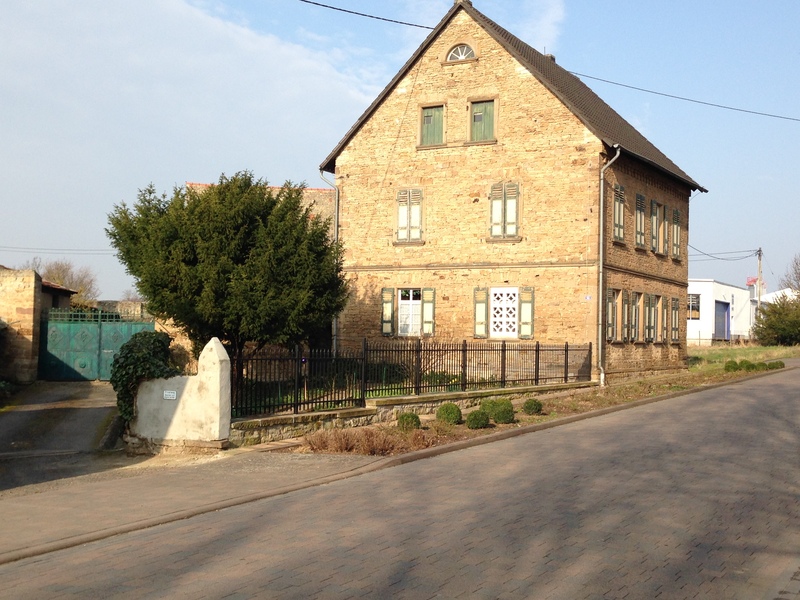 It closed before 1932 because there was no longer a Jewish community in Gau-Algesheim. Today it is a storage shed behind someone’s house. 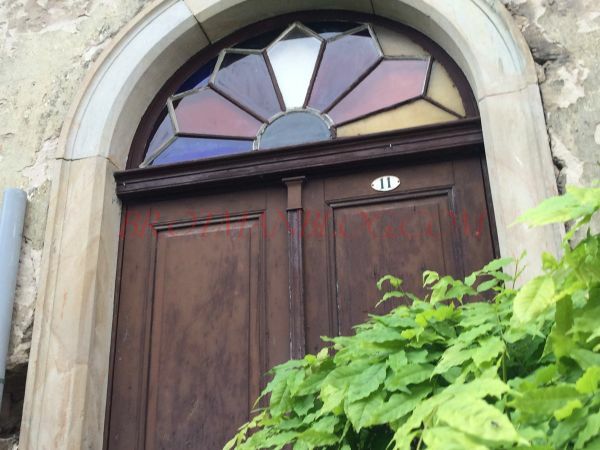 But the stained glass window over the door and the windows convey that this was once a house of prayer. A shul where my ancestors prayed almost 200 years ago. 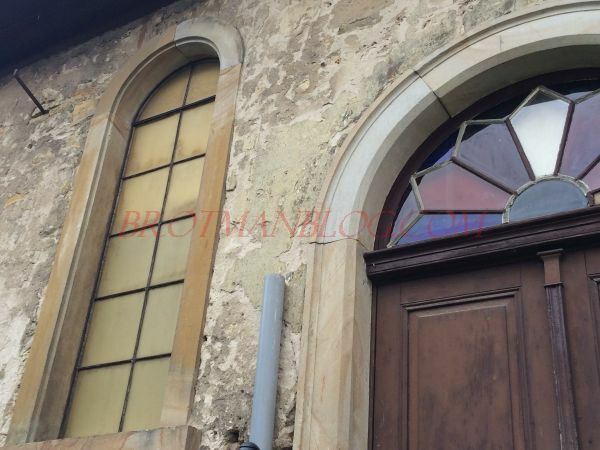 It was awful to see its current condition, and I wish there was some way to create a fund to protect and restore the building before it deteriorates any further. I am hoping I can figure that out. 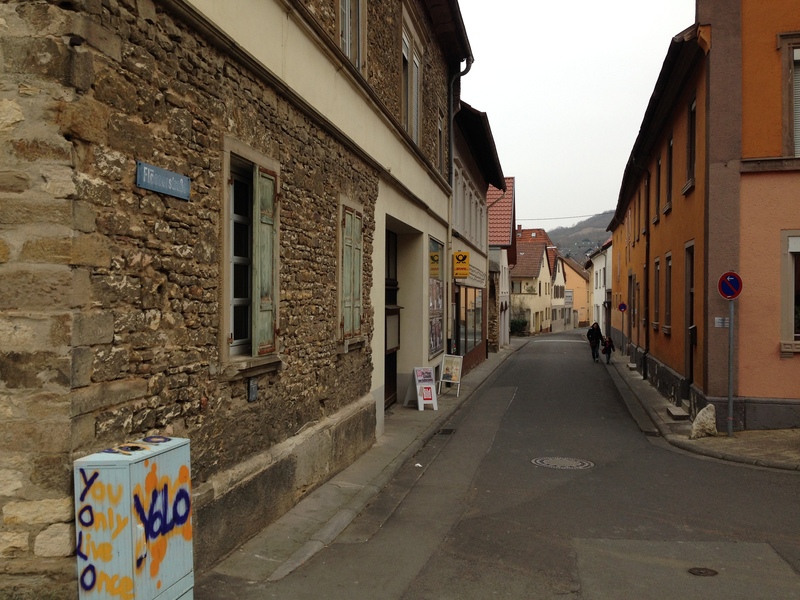 We walked then along the streets where my family had once lived, saw the building where Wolfgang’s grandfather Julius once had a shop, and the street where my great-great-grandfather Bernard and his siblings were born. It was surreal. And emotionally exhausting. 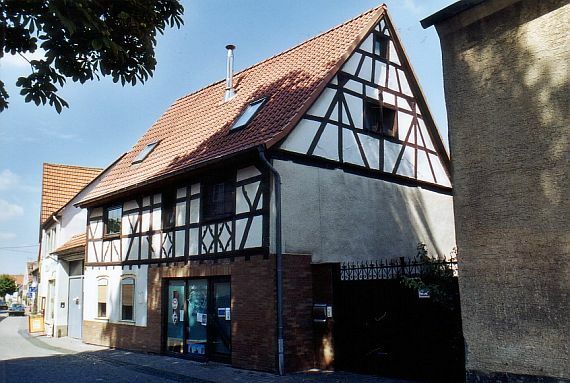 Maybe our ancestors once lived in this grand half-timber house on Flosserstrasse? 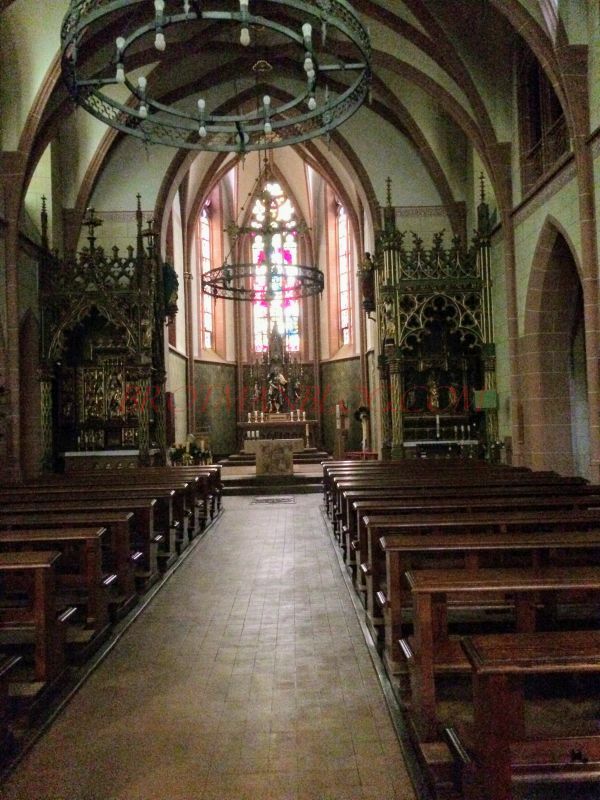 Our last stop was the Catholic Church in Gau-Algesheim, which Herr Wantzen was very excited to show us. 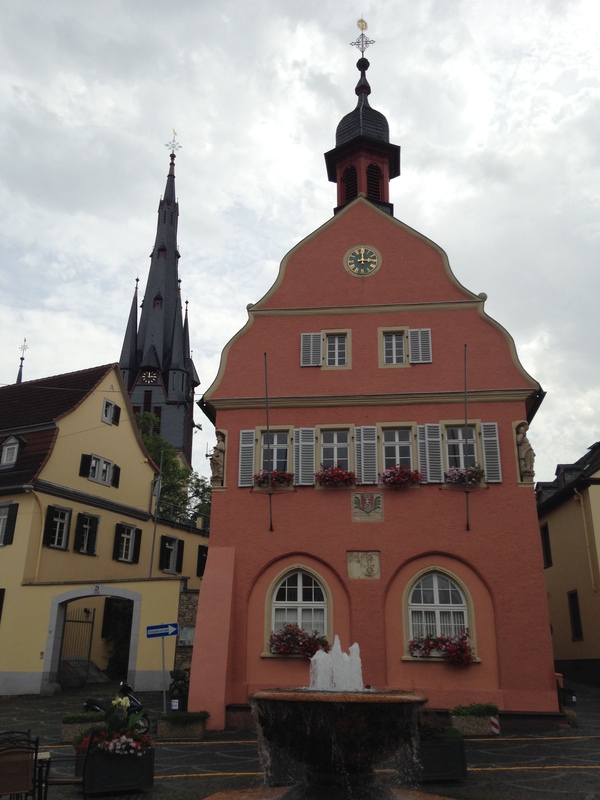 It was beautiful—far larger and more elaborate than one might expect in such a small town. 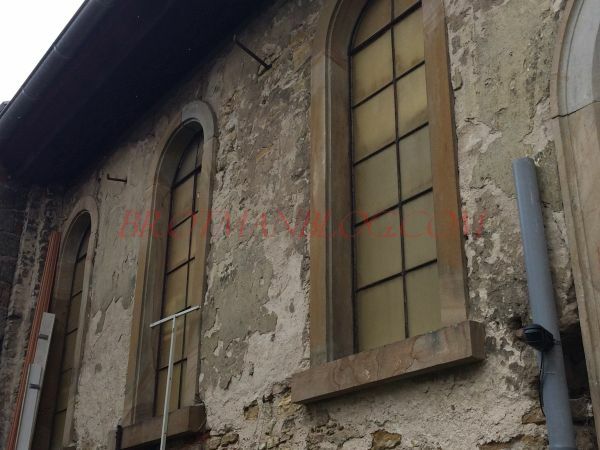 And a striking contrast to the size and condition of the abandoned synagogue. 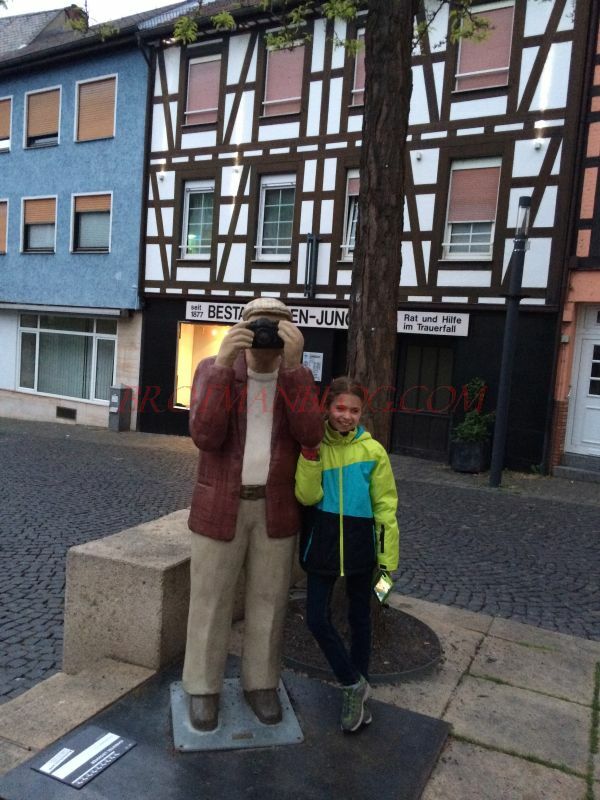 We said goodbye to Dorothee and Herr Wantzen and returned to our hotel for a rest, and then at 6, Wolfgang picked up us again for dinner with his family in Bingen. 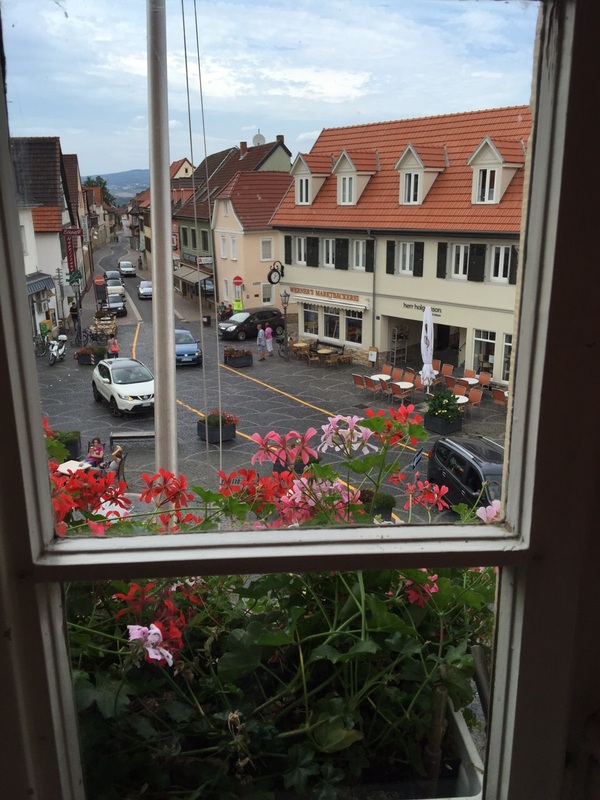 We went to another very good restaurant, Alten Wache, and again had a wonderful time. 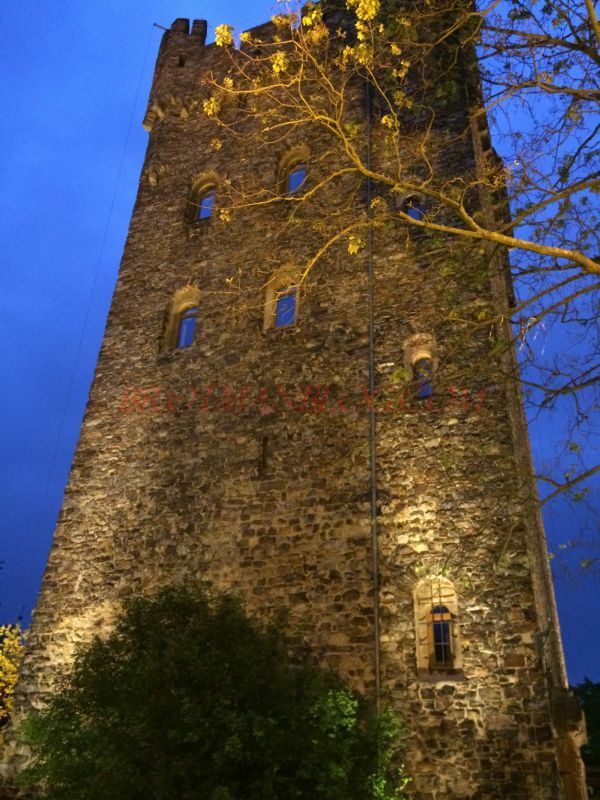 After dinner we all climbed up the many steps to the Burg Klopp, the medieval castle that sits at the top of the hill overlooking Bingen. As the sun began to set, the views were awe-inspiring. 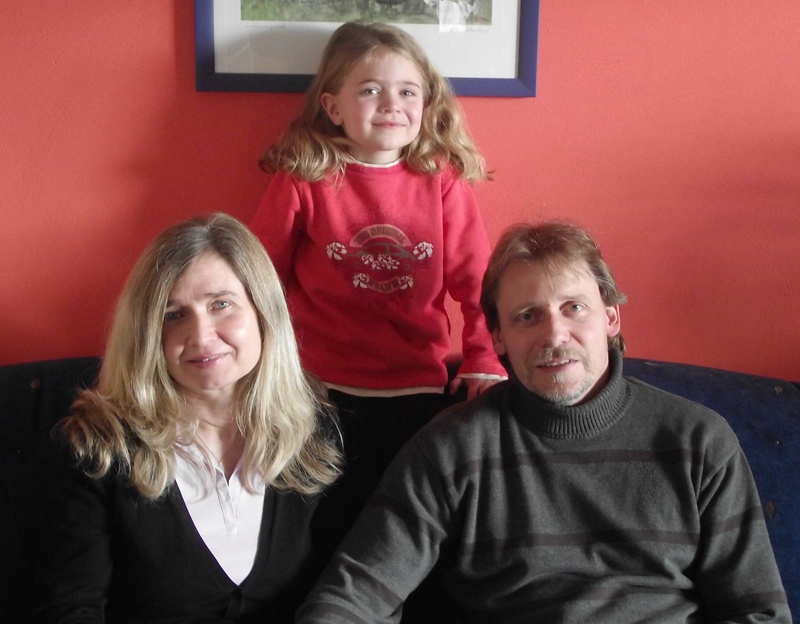 But I was already starting to feel emotional about saying goodbye to my wonderful cousins, Wolfgang, Bärbel, and Milena. When Milena said to me in her perfect English that she was going to miss me, my eyes filled with tears. 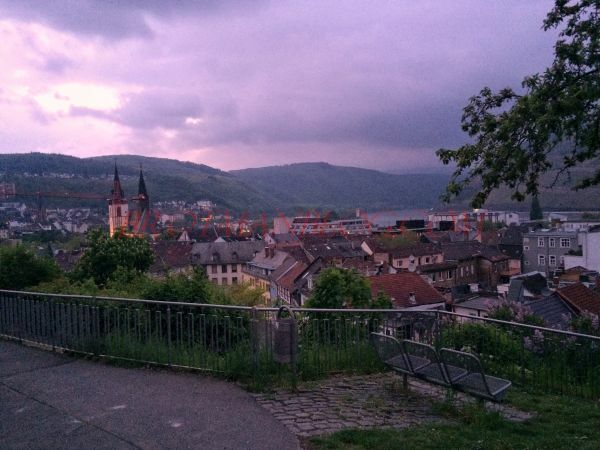 It was very hard to say goodbye, but I know that I will see my Seligmann cousins again—somewhere, sometime. And until then, we have WhatsApp, email, and all our wonderful memories. 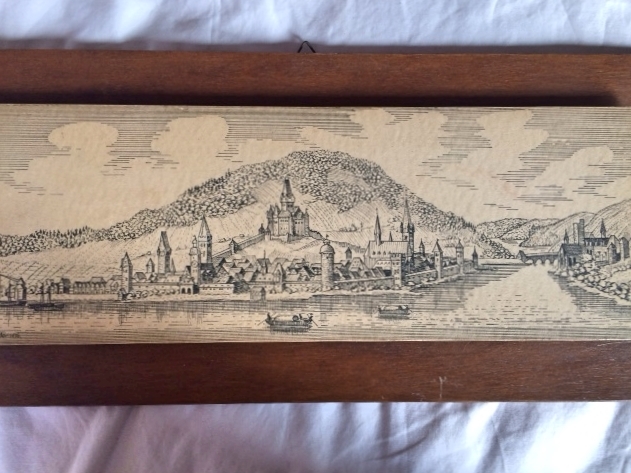 Auf wiedersehen, Wolfgang, Bärbel, Milena—and Bingen, Gau-Algesheim, and Mainz. It was time to move on the next step of our journey. 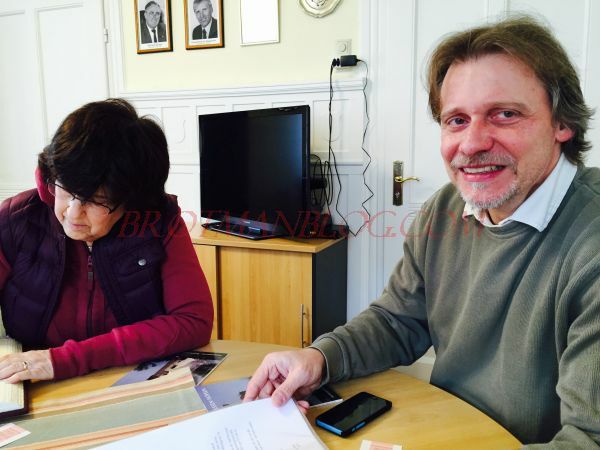 My friends and former colleagues Barbara and Rene just returned from a trip to Germany. Rene’s family lives not too far from Gau-Algesheim, and he and Barbara were kind enough to travel to my ancestral town and take some photographs. Some of these have text that I need to get translated. As I’ve observed from other photographs of this town, it appears to be a charming, small town with lots of character. I think that Barbara and Rene have really captured that impression of the town. Thanks so much, Rene and Barbara! 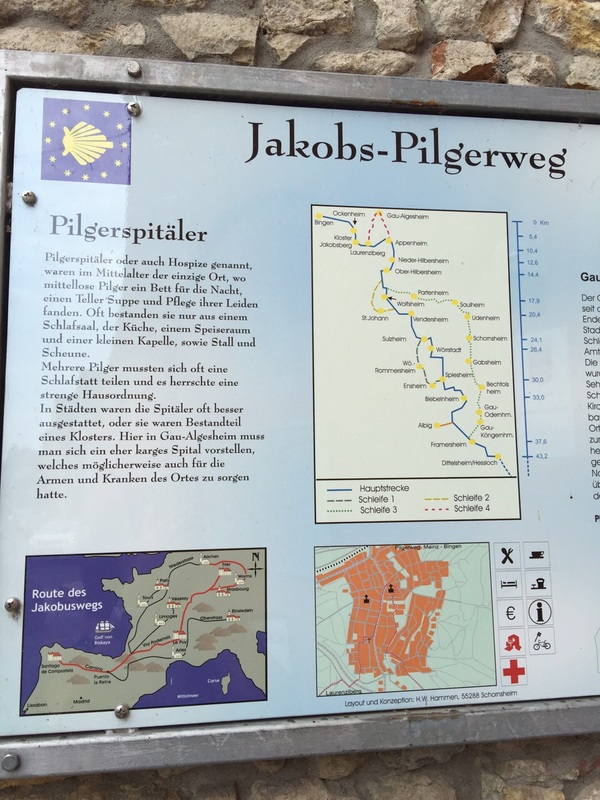 Pilgrim Hospitals, also called Hospices, were, in the Middle ages, the only place where destitute Pilgrims could find a bed for the night, a bowl of soup and care for their suffering. Often consisting of only a sleeping hall (large communal bedroom), the kitchen, a dining room, and a small chapel, as well as stalls and barn. 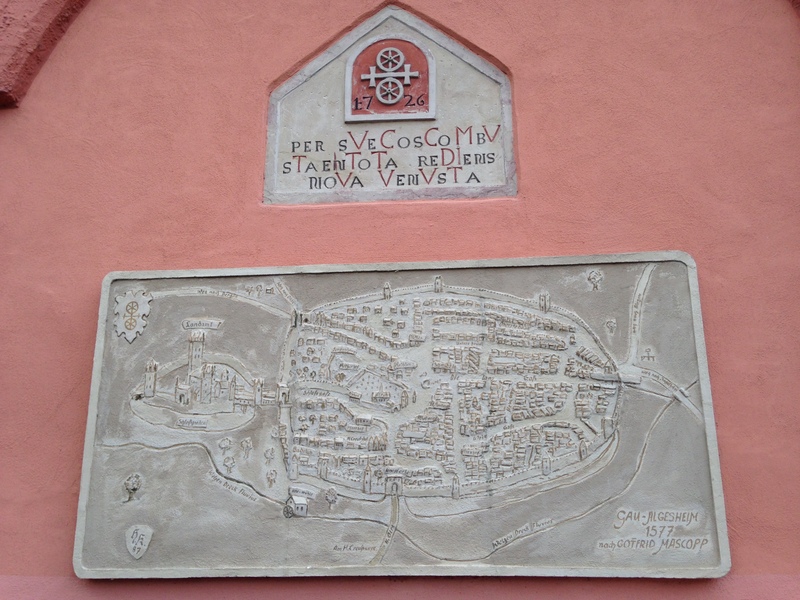 In cities, the hospices were often better equipped, or were part of a cloister. 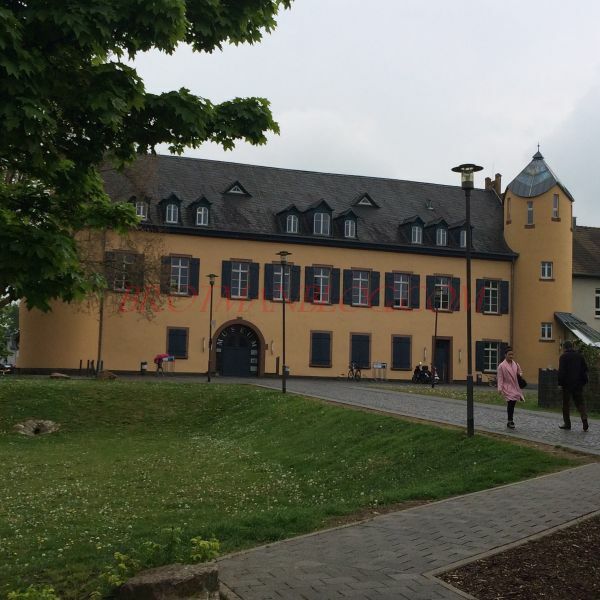 Here in Gau-Algesheim you have to imagine a rather meager hospital which, possibly, had to provide for the poor and sick of the place. 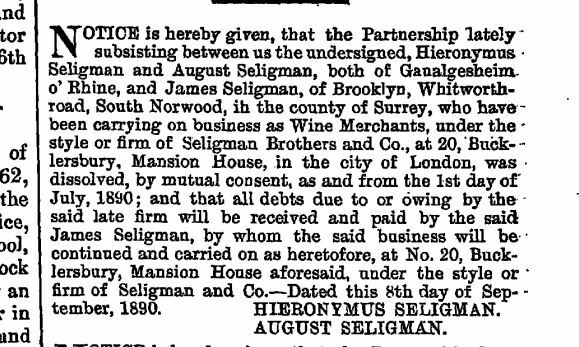 I am working on a blog post about the descendants of the last child of Marx and Sarah Seligmann, Mary Seligman Kornfeld, but am awaiting some documents before I can post it. 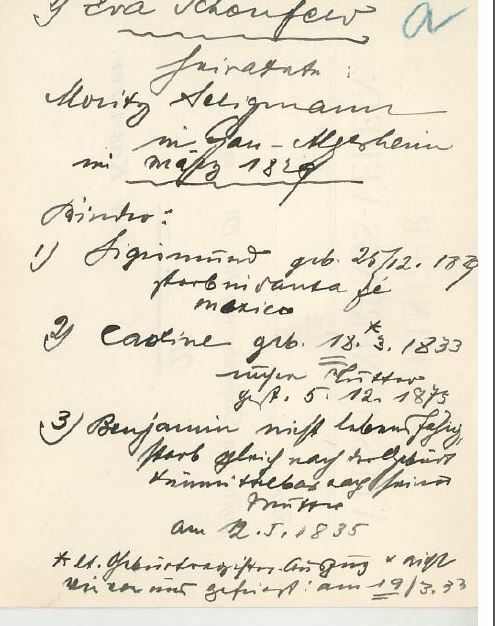 So I am going to digress in this post from that line and return to my three-times great-grandfather, Moritz Seligmann (who was, of course, an older brother to Marx Seligmann). 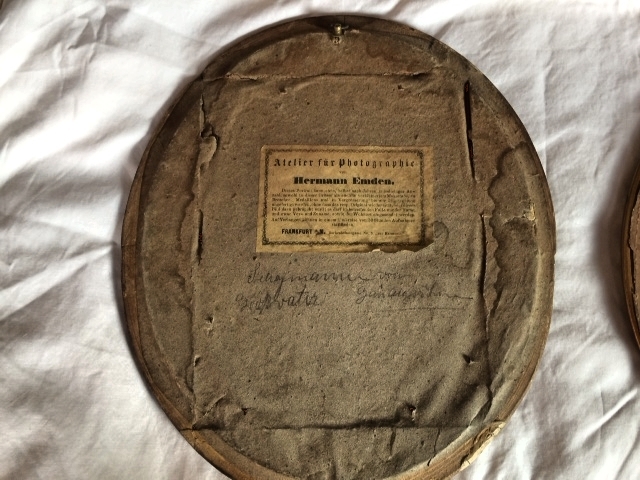 When my cousin Wolfgang sent me the handwritten family tree he and his mother found in their magic suitcase, he had originally not included the pages about Moritz, thinking I had all the information I needed about Moritz and his children. I asked him to send them to me anyway so that I would have the full document, even if there was no new information. But in fact there was some new information or at least information that corroborated or clarified assumptions I had made based on inference, anecdotes, and other documents. 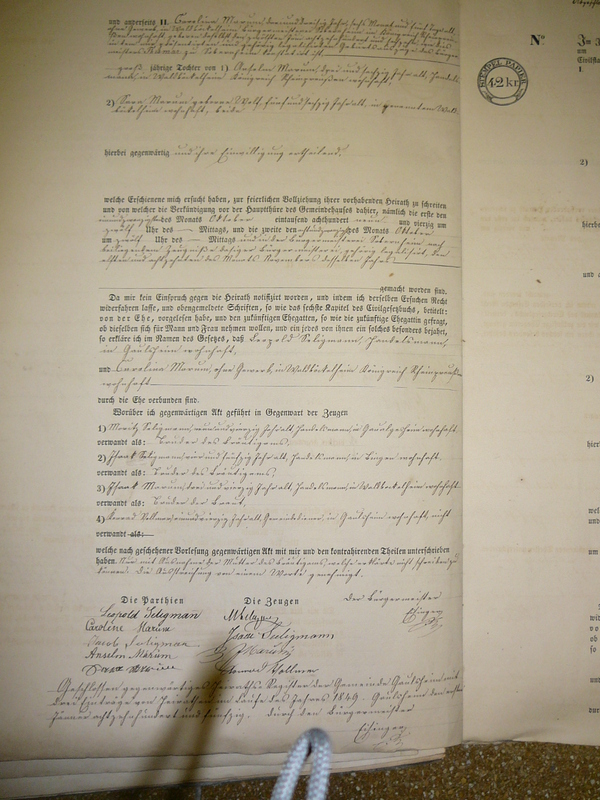 The first page names Moritz and his first wife, Eva Schoenfeld. 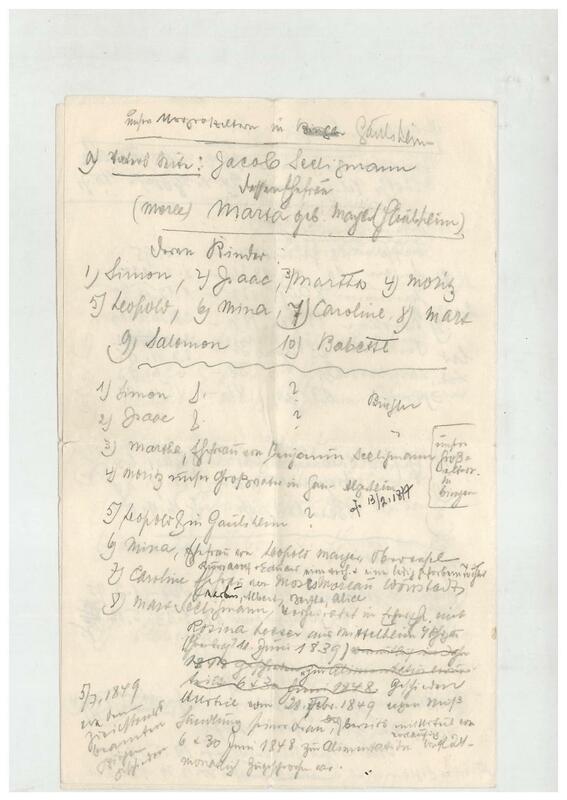 The next page lists the children of Moritz and Eva Schoenfeld. 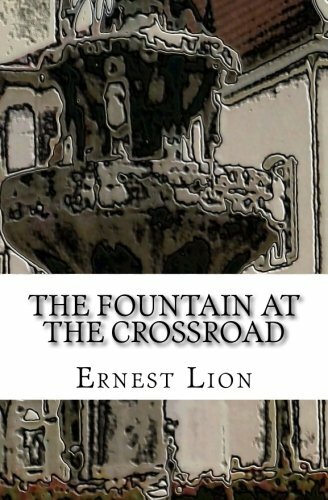 I had wondered what had caused Eva’s death and also what had happened to their son Benjamin. This page answered both questions. Benjamin died shortly after his birth as did his mother, so I assume it was related to childbirth. 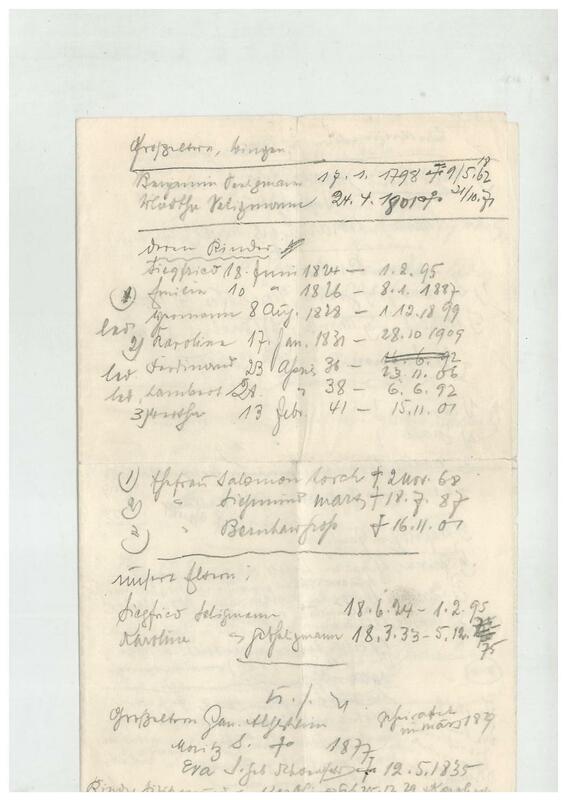 This page also provided confirmation and new information about when the other children died. 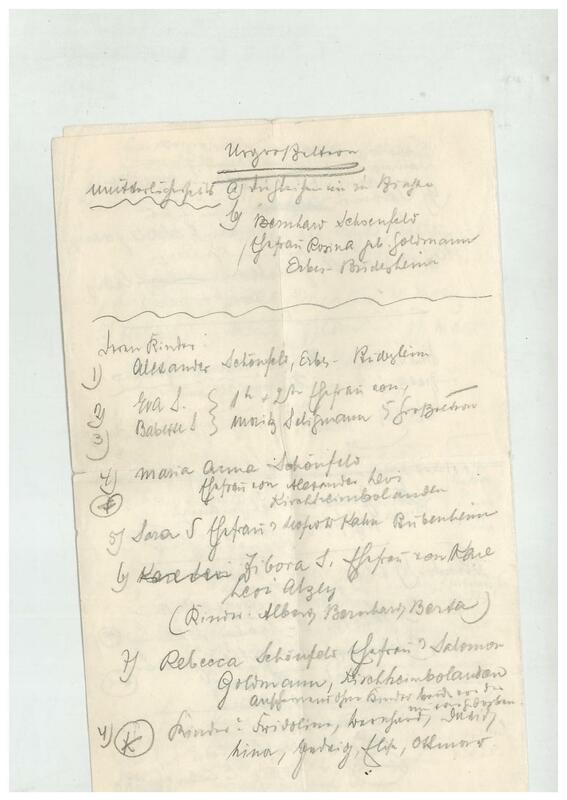 On the third page, the writer identified Babetta Schoenfeld as the second wife of Moritz Seligmann and lists their children. There were several bits of important new information here. 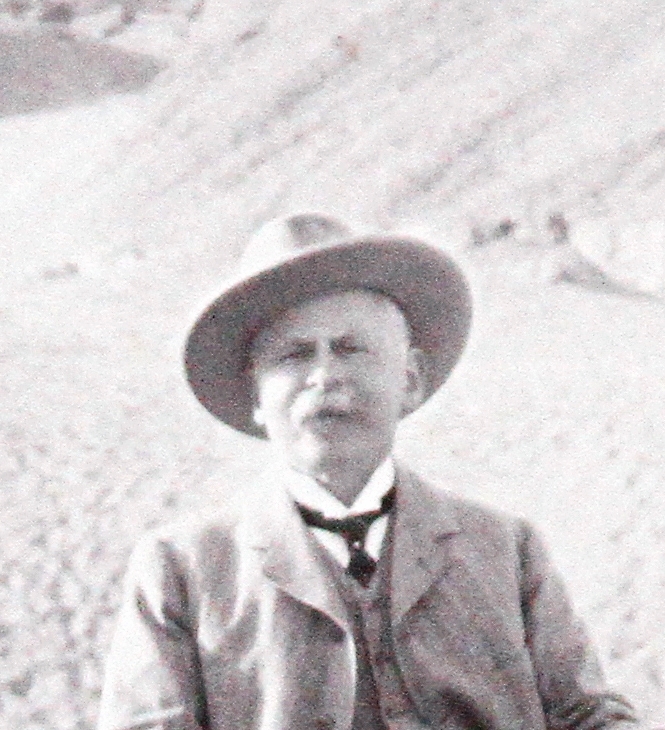 One is the date of Babetta’s death: January 15, 1899. It also states that she was 89 years old. 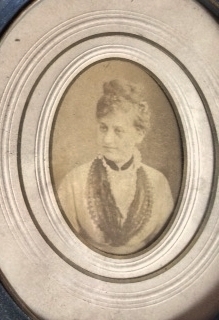 This information helps to confirm that the photograph of the family group with the elderly woman was in fact a photograph of my three-times great-grandmother Babetta. The other bit of interesting information on this page is in the list of children. The last child listed is Jacob, and it indicates that he was in England. 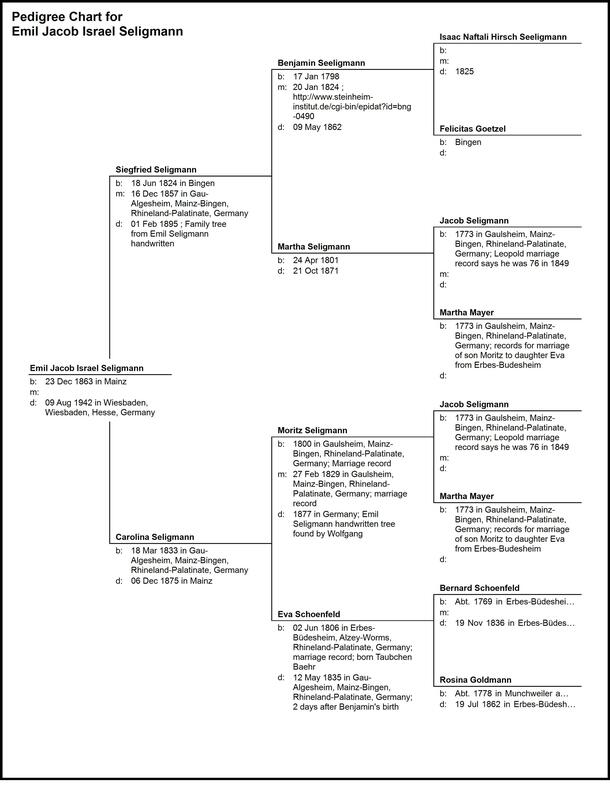 This is further corroboration of the fact that Moritz’s brother James Seligman who immigrated to England was in fact named Jacob at birth and is most likely the Onkel Jakob in the family photograph with Babetta, below. In addition, from this page I was able to learn when several of the other children of Moritz and Babetta had died. The remaining pages cover some of the children of Moritz: Pauline, Hieronymous, August, and Mathilde. Although I did not find any really new information on these pages, they do provide additional confirmation of the information I already had as well as some dates I did not have. Unfortunately, some of the writing is not legible, and so I cannot determine what those additional words say. 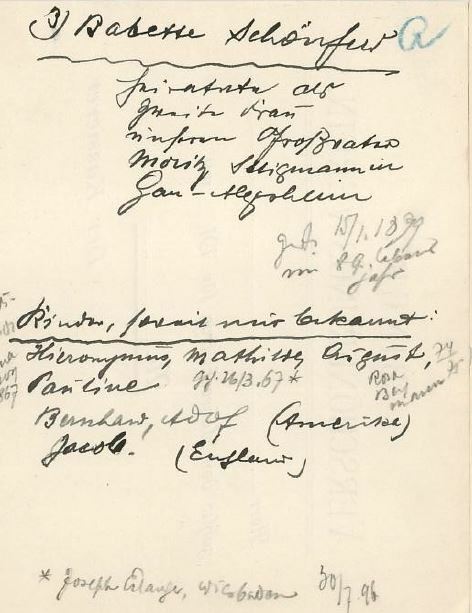 If anyone can read them, let me know. I’ve circled the words I cannot read. 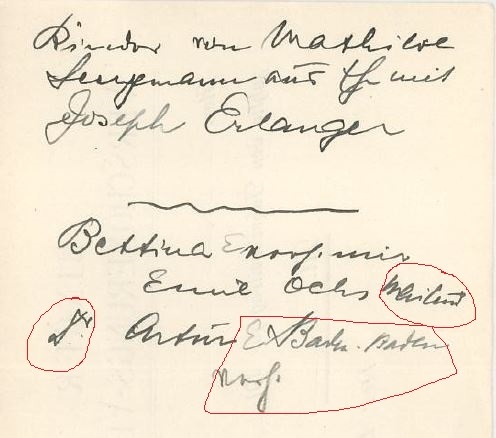 UPDATE: My friend Dorothee in Germany tells me that the words after Joseph and Moritz indicate that they were both married and also both divorced. 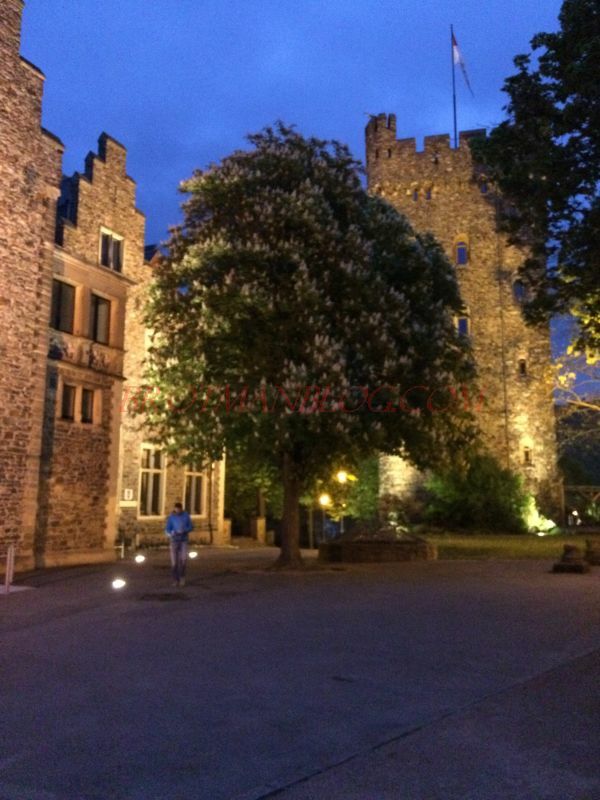 Thank you, Dorothee! 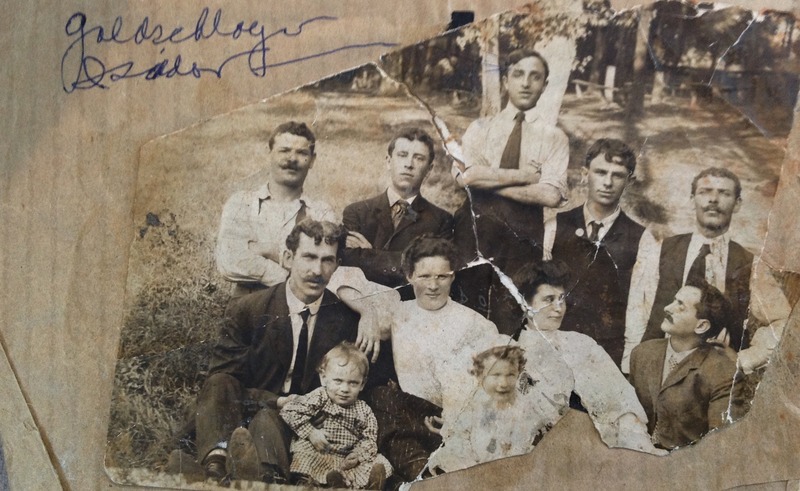 My friend Ralph added to this, saying the words to the far right of Joseph say, “Son and daughter.” Unfortunately, I have no records for Joseph’s children. 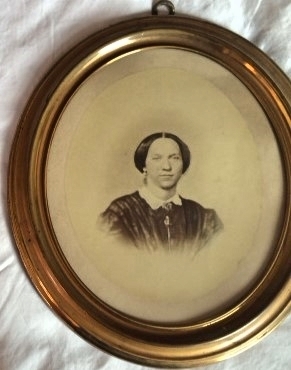 Ralph also said that to the right of Martha, it says in part “Floersheimer,” which was her married name. Thank you, Ralph! 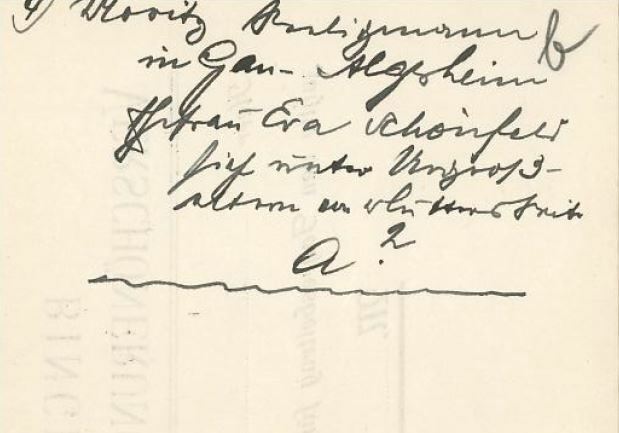 UPDATE: Dorothee says that the symbol before Artur means “doctor” and the words after Artur say “in Baden-Baden, married.” Thank you again, Dorothee! 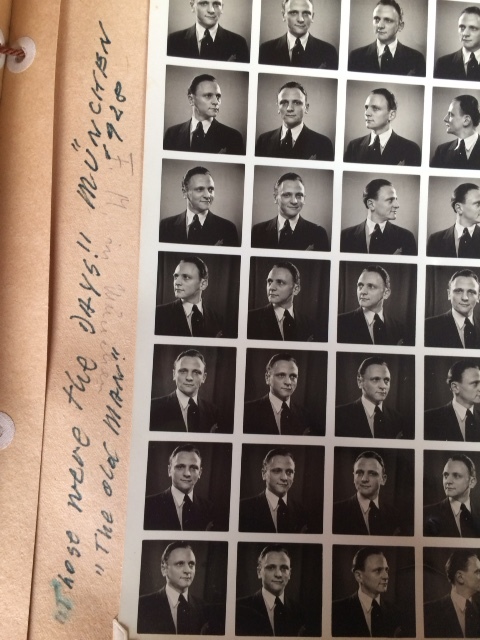 Ralph added that the word next to Emil Ochs could be Mailand (Milan), which would make sense since Bettina entered Switzerland from Italy, as I wrote here. Thank you again, Ralph! 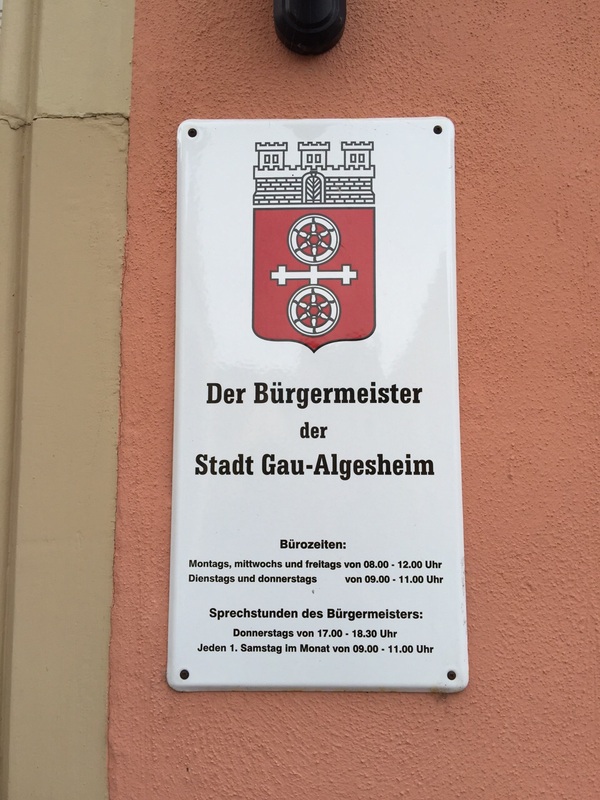 My newly-discovered cousin Wolfgang Seligmann lives close to our shared ancestral towns of Gau-Algesheim and Erbes-Budesheim. 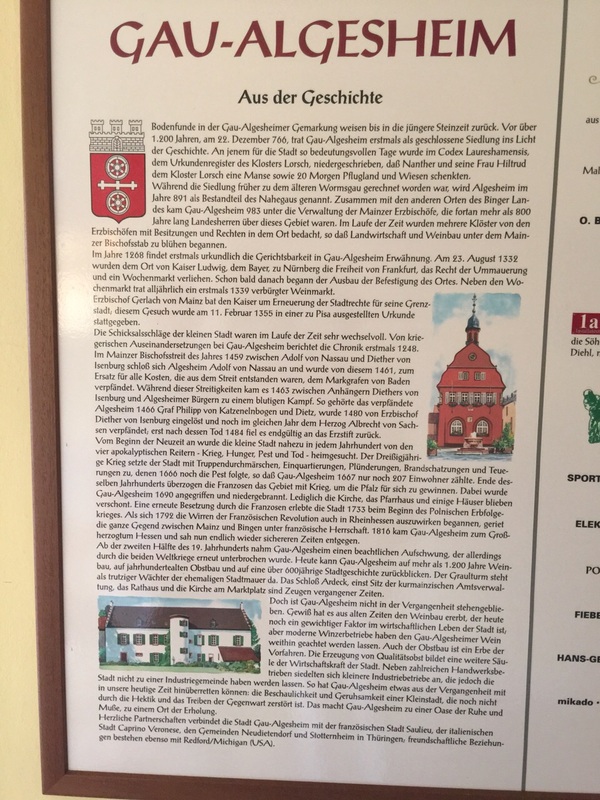 Erbes-Budesheim is where Babetta Schoenfeld was born and raised; Babetta is my 3-x great-grandmother and Wolfgang’s great-great-grandmother. 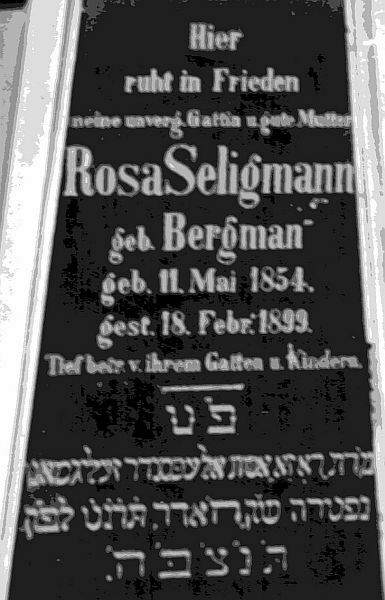 Babetta married Moritz Seligmann, and together they settled in Gau-Algesheim where they had a number of children, including Bernard Seligmann, my great-great-grandfather, and August Seligmann, Wolfgang’s great-grandfather. 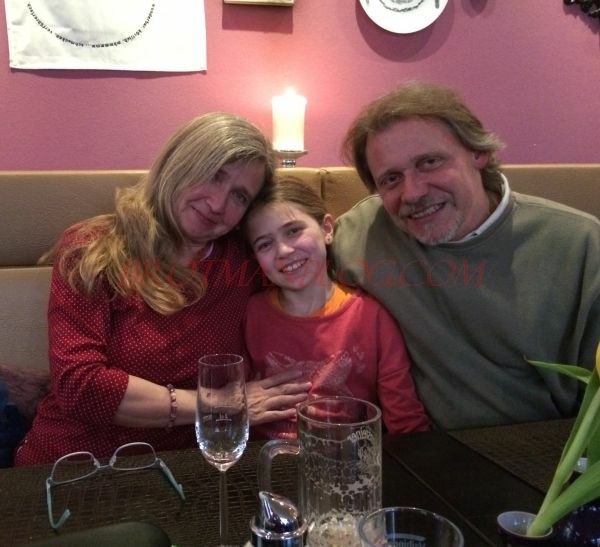 Here is a recent photo of Wolfgang with his wife Barbela and daughter Milena—my beautiful German cousins. 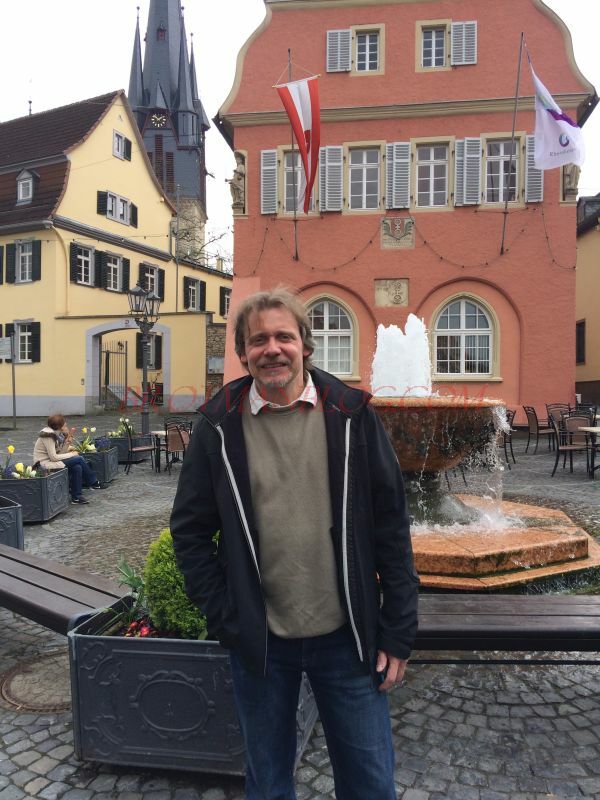 Wolfgang went to both Gau-Algesheim and Erbes-Budesheim recently to take some photographs of the towns and to look for the houses where our ancestors lived. 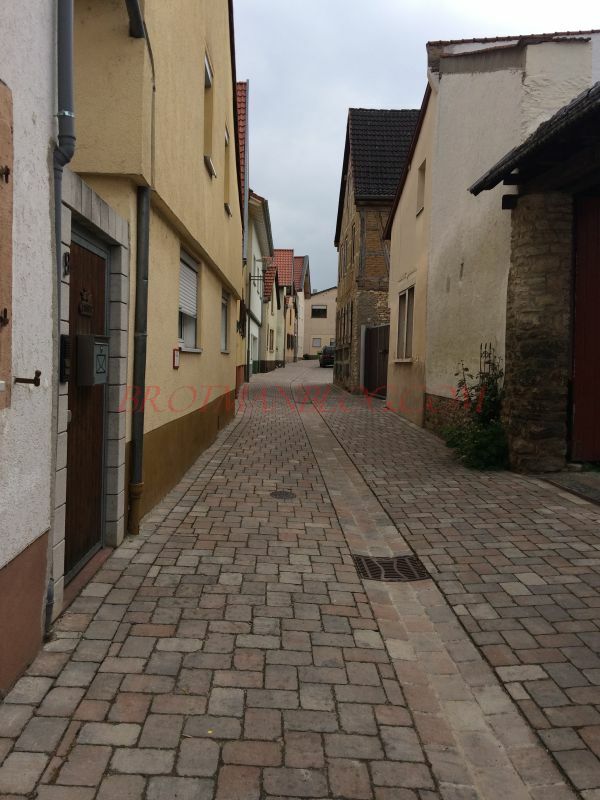 In Erbes-Budesheim, he looked for the houses at 77 and 80 Hauptstrasse where the Schoenfelds lived almost 200 years ago, but unfortunately those houses must have been torn down, and now a new street and a factory stand where those houses must have stood. 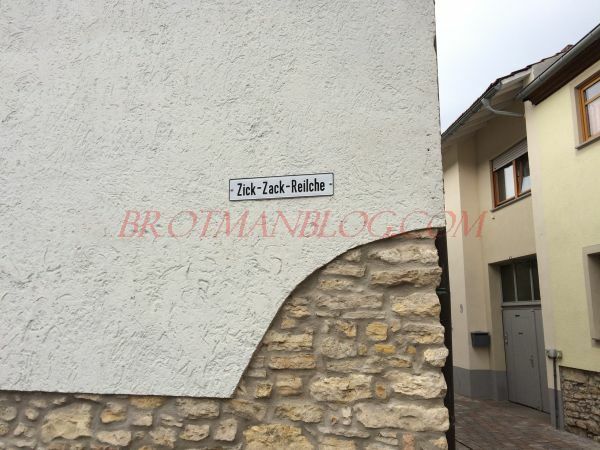 But Wolfgang took some photographs of other houses, including one at 50 Hauptstrasse, to capture what the Schoenfeld house might have looked like and also to depict the type of homes they saw on their street. 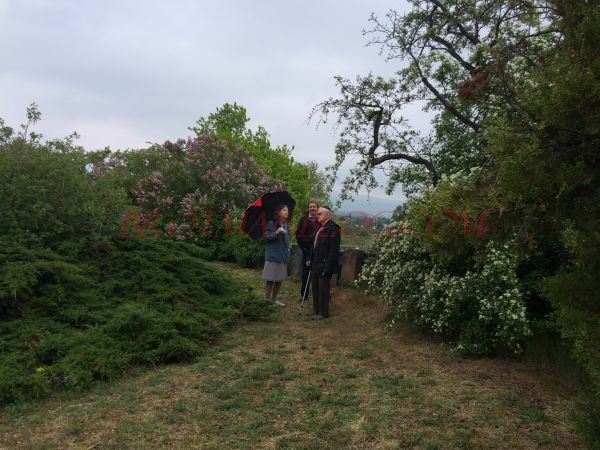 Wolfgang also visited the Jewish cemetery in Erbes-Budesheim. 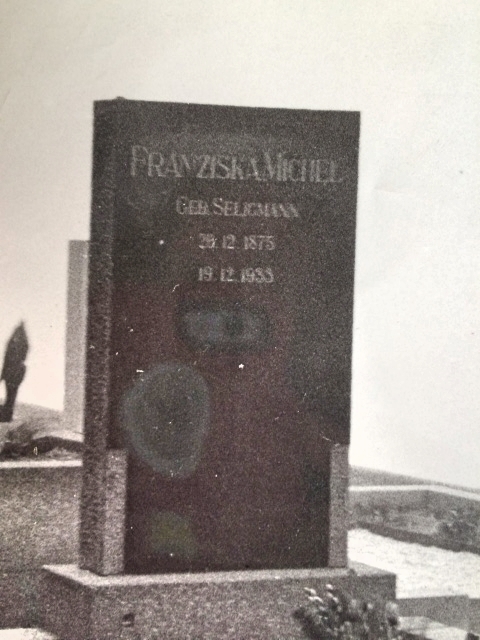 He reported that there were only a few headstones left and none for the Schoenfelds. 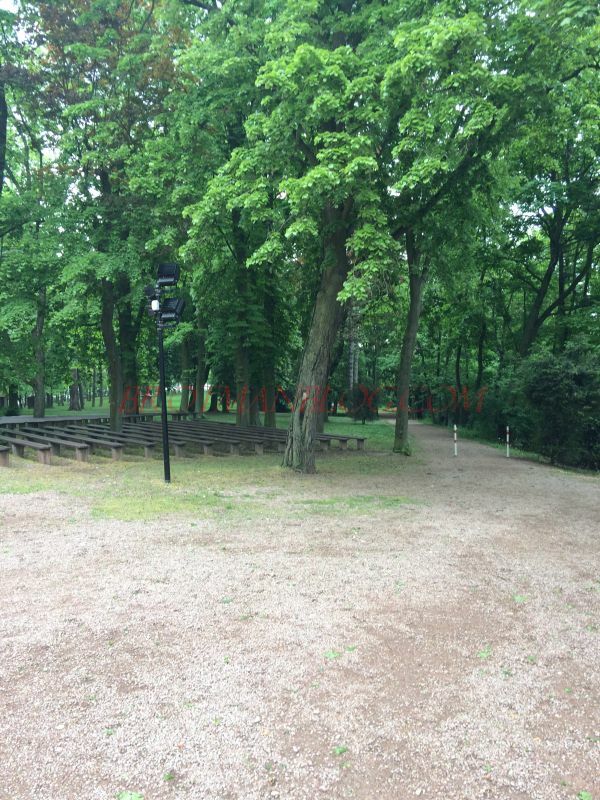 Here are some photographs he took of the cemetery. It looks like such a peaceful and scenic spot. Although Wolfgang did not locate any Schoenfeld headstones there, this older video taken in 2010 does show some headstones with the Schoenfeld name, so I wonder whether these have been destroyed since that video was taken. 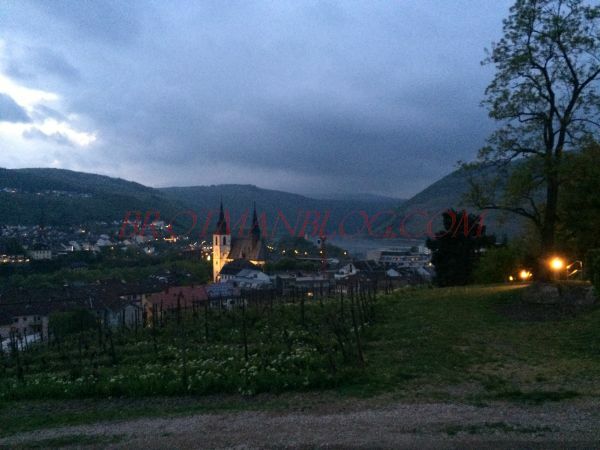 Wolfgang also visited Gau-Algesheim and took some photographs there. 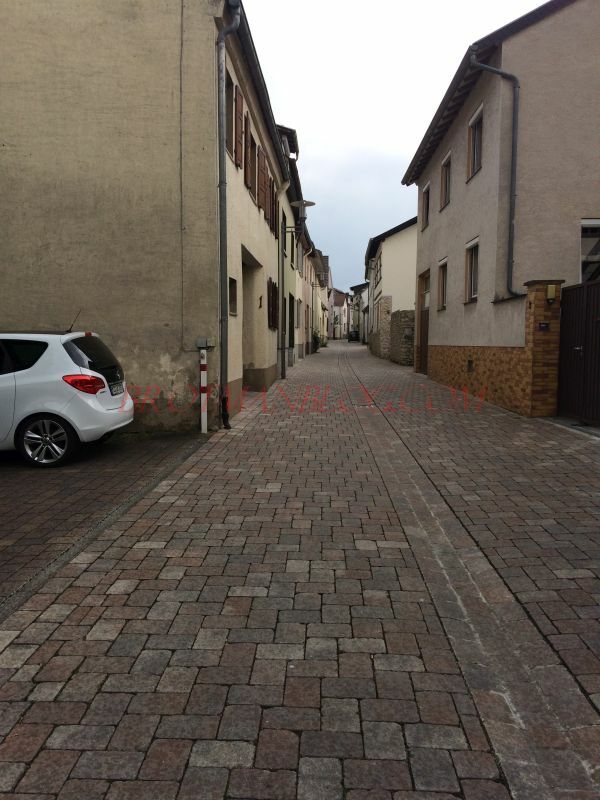 First is a photo of Flosserstrasse, one of the main streets in Gau-Algesheim. Our ancestors Moritz and Babetta and their children lived on Flossergasse, which no longer seems to exist, but must have either been a prior name or a smaller street off of the main street. 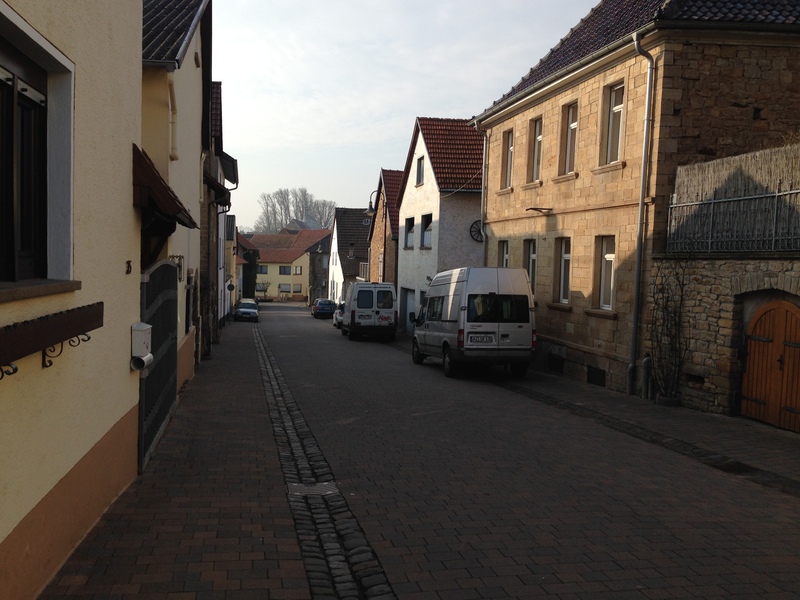 The other main street in Gau-Algesheim is Langgasse. 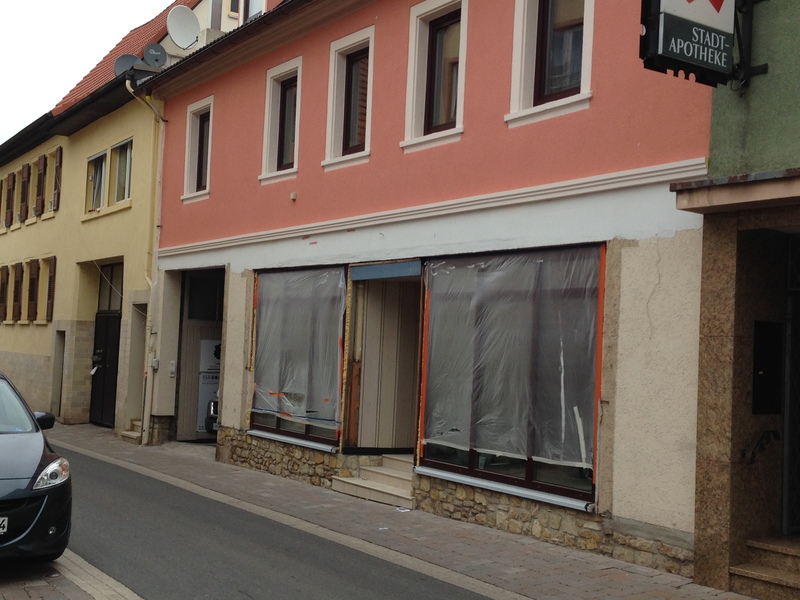 The store owned by Wolfgang’s great-grandfather August and his grandfather Julius was on this street, and the house where Julius and his wife Magdalena lived until relocating to Bingen was also located on Langgasse. 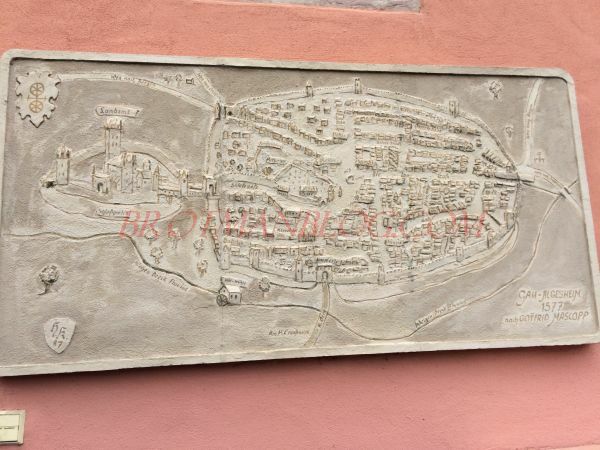 Because the original building is no longer there, Wolfgang also sent me this newspaper clipping which depicts on the left what Langgasse looked like in 1900 and when Julius lived and worked there. 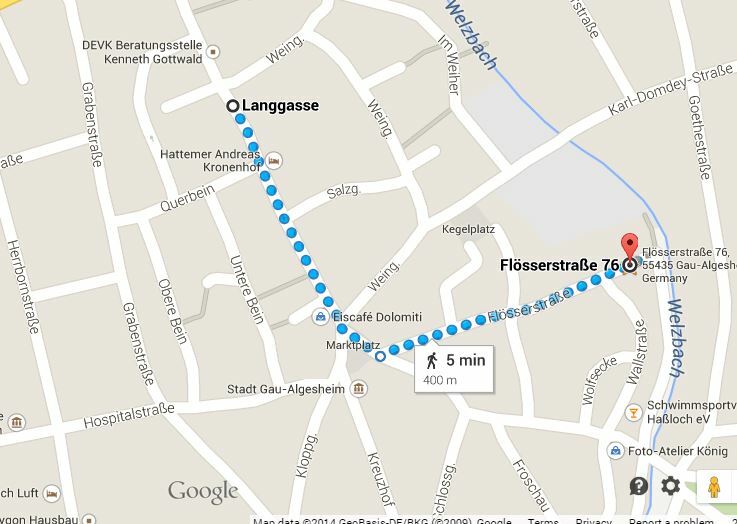 This is the town center where Langgasse and Flosserstrasse meet. 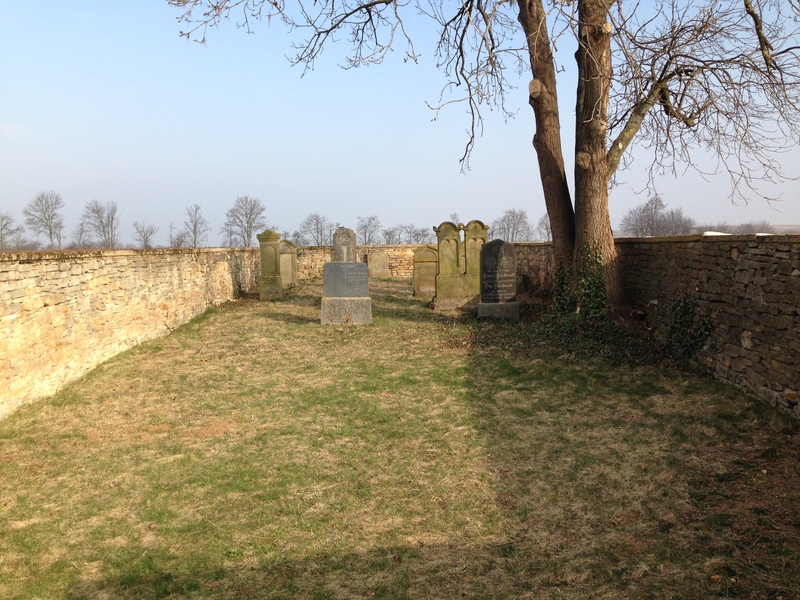 Finally, Wolfgang also visited the Jewish cemetery in Gau-Algesheim. 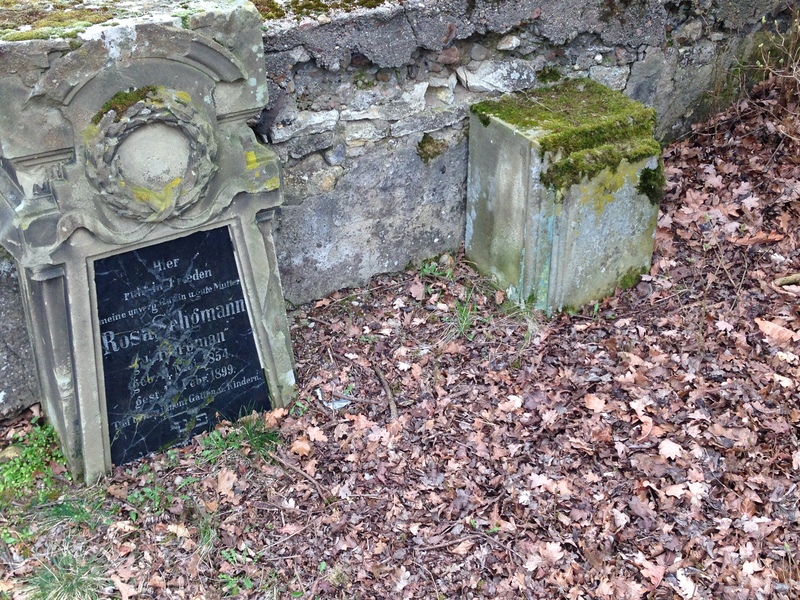 According to Wolfgang, the cemetery was vandalized in 1998 by “some idiots,” as Wolfgang described them. He commented that even today there is some anti-Semitism in Germany. Although Wolfgang noted that there are not many who feel this way, it only takes a few to do damage like this. I am so very grateful to my cousin Wolfgang for taking these photographs. 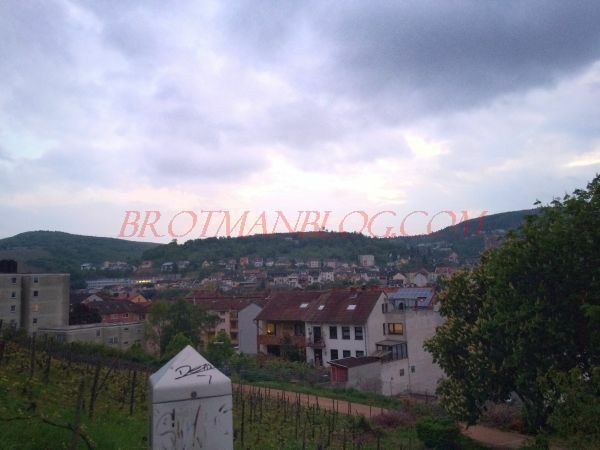 There is something very touching and special about seeing these towns through the eyes of my cousin, a fellow descendant of Moritz Seligmann and Babetta Schoenfeld. I know he looks at these places with the same sense of connection that I would feel if I were standing in those places, and I look forward to standing there with him in the hopefully not too far off future. 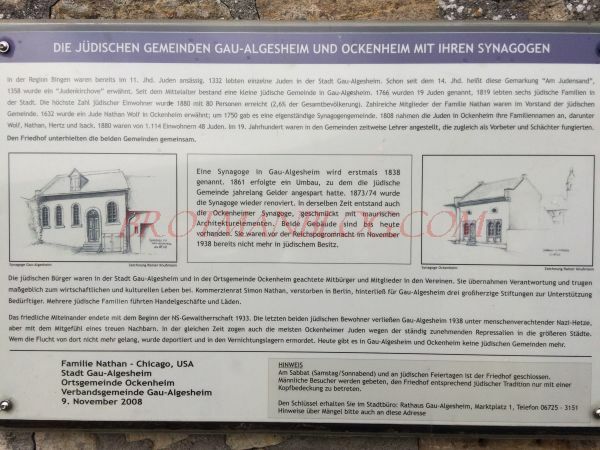 All photographs on this post except the two from alemannia-judaica are courtesy of Wolfgang Seligmann. 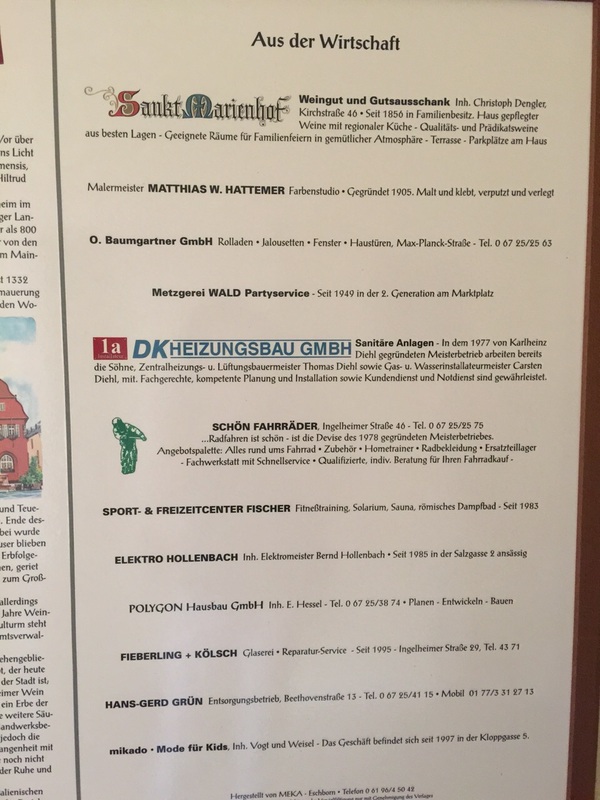 While you all may have thought that for the last several months I was obsessed with Nusbaums and Dreyfusses (and I guess I was), there were several other things happening in my genealogy life (not to mention my actual life) that I haven’t had a chance to blog about yet. 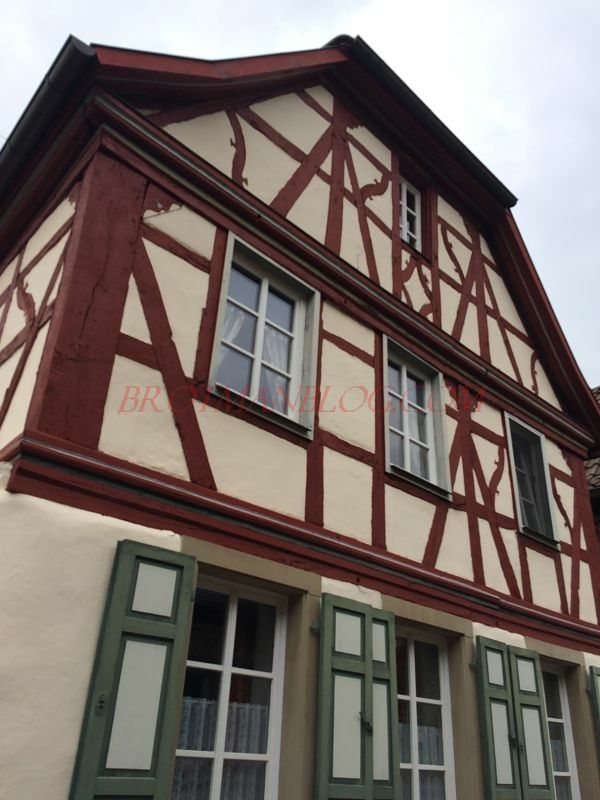 One of the biggest things was the discovery of documents and information about another line of my family, the Schoenfelds, and another ancestral town, Erbes-Budesheim. 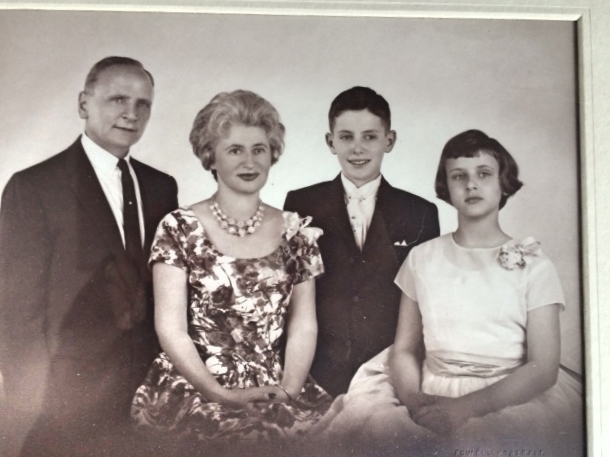 Who are the Schoenfelds? 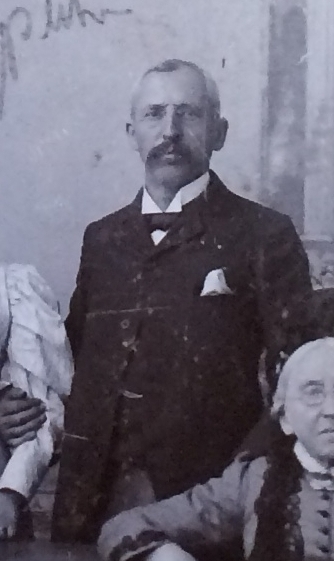 Moritz Seligmann, my 3-x great-grandfather from Gau Algesheim, married two Schoenfeld sisters (not at the same time, of course). 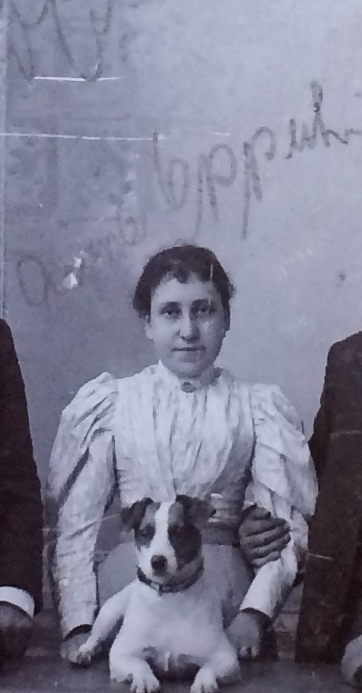 First, he married Eva Schoenfeld and had four children with her, and then he married her younger sister, Babetta, my 3-x great-grandmother, the mother of Bernard Seligman, my great-great-grandfather. 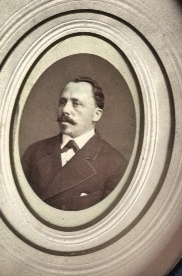 Moritz and Babetta had seven children together in addition to the four born to Eva. Because the birth names of women often disappear, it is all too easy to overlook the family names and lines that end when a woman changes her name to that of her husband. 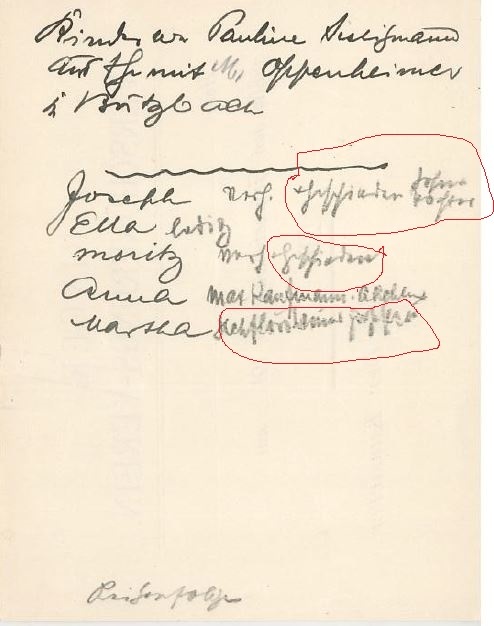 Although I was always aware of the family names of Goldschlager, Brotman, Cohen, Nusbaum, and Seligman (as well as those from my paternal grandmother’s side, not yet covered on the blog), I had no awareness of a family connection to the names Rosenzweig, Dreyfuss, Jacobs, and Schoenfeld. 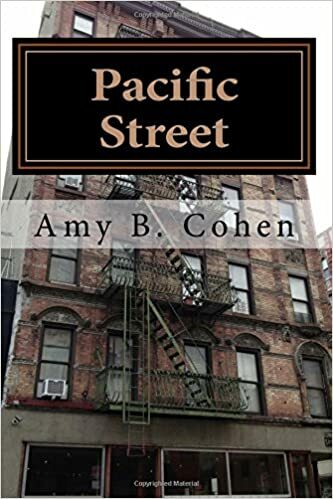 Discovering the Schoenfeld name, like discovering those others, was an exciting revelation and addition to my extended family tree. 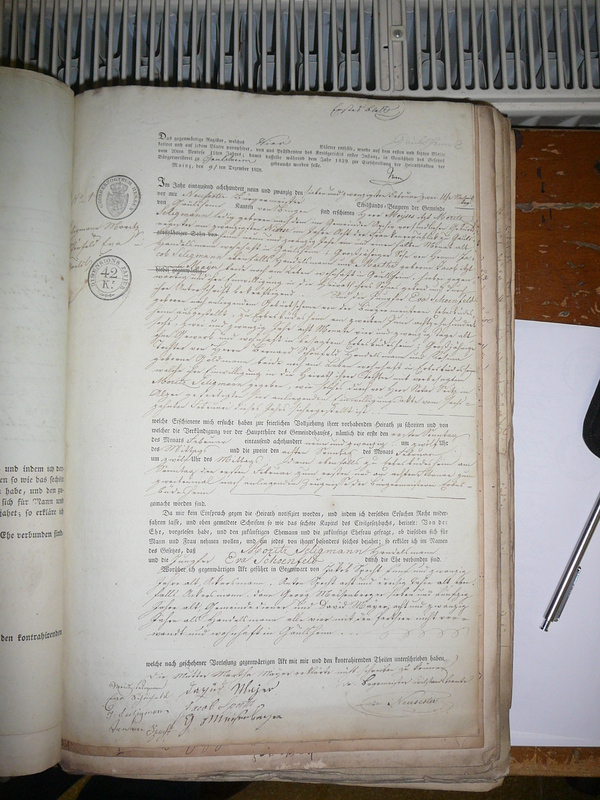 From there I contacted the registry in Erbes-Budesheim to ask about records for my Schoenfeld ancestors, and within a short period of time, I received several emails from a man named Gerd Braun with an incredible treasure trove of information and records about my Schoenfeld ancestors. 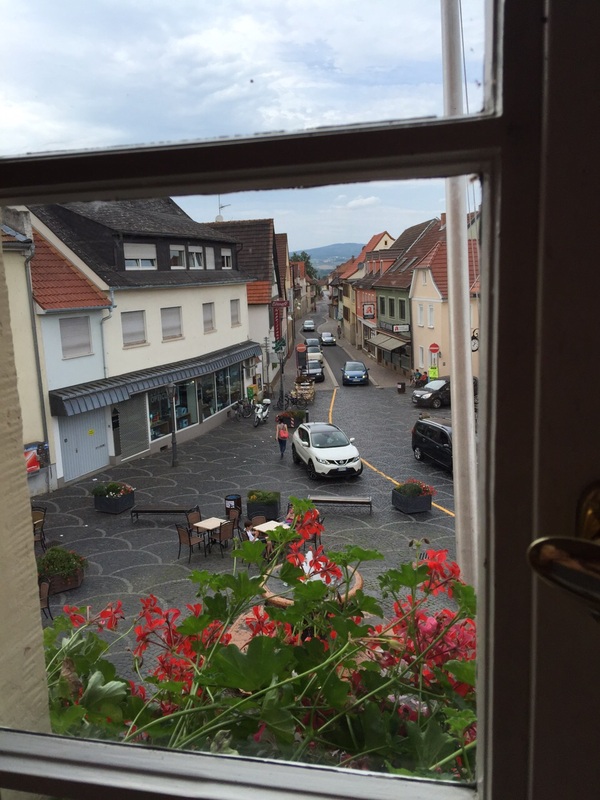 But first, a little about Erbes-Budesheim. 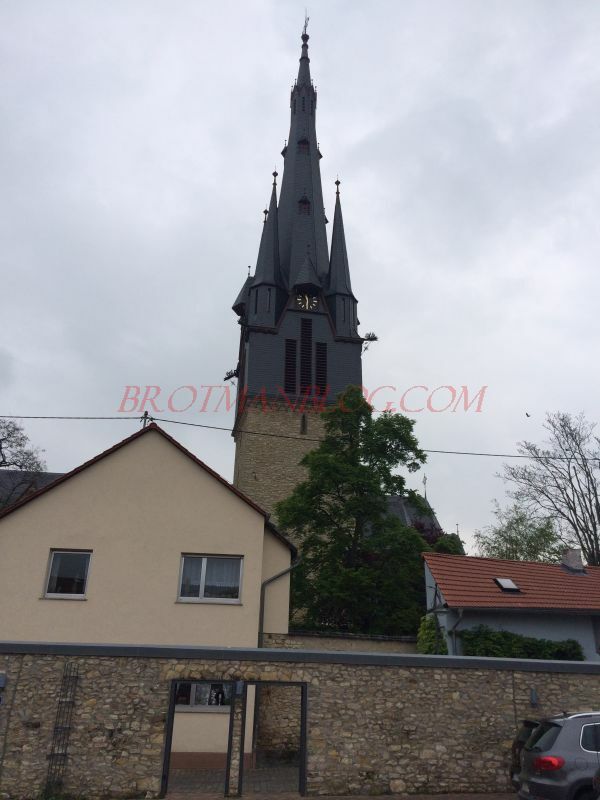 Erbes-Budseheim is a municipality in the Alzey-Worms district of the Rhineland-Palatine state in Germany. 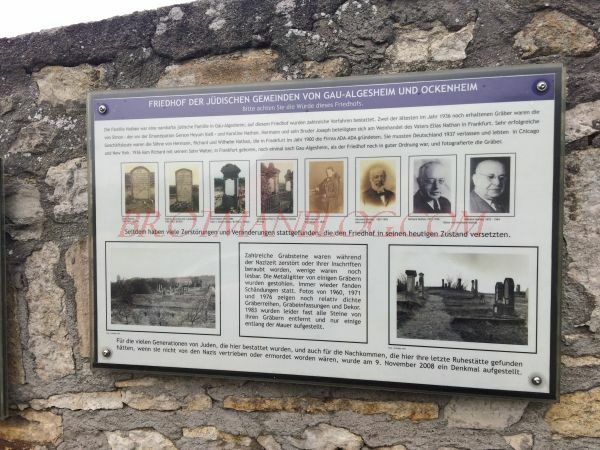 It is located about 25 miles south of Gaulsheim where Moritz Seligmann was born and grew up and about 27 miles south of Gau Algesheim where Moritz and his family eventually settled. The closest major city is Frankfort, about 46 miles away. The town has an ancient history, dating back to the Stone Age, according to Wikipedia. Like many regions in Germany, it was subject to various wars and conquerors throughout much of its history. 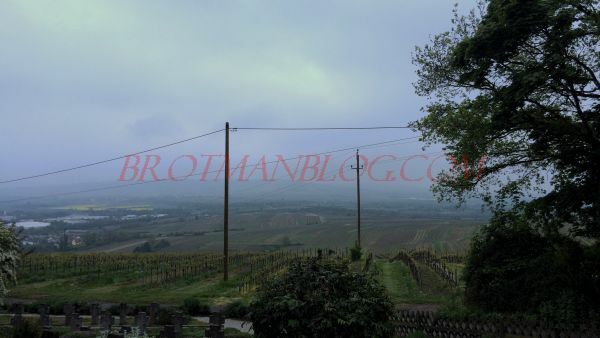 During the Napoleonic era in the late 18th, early 19th century, Erbes-Budesheim and the entire Alzey region were annexed as part of France; after 1815 it was under the control of the Grand Duchy of Hesse. 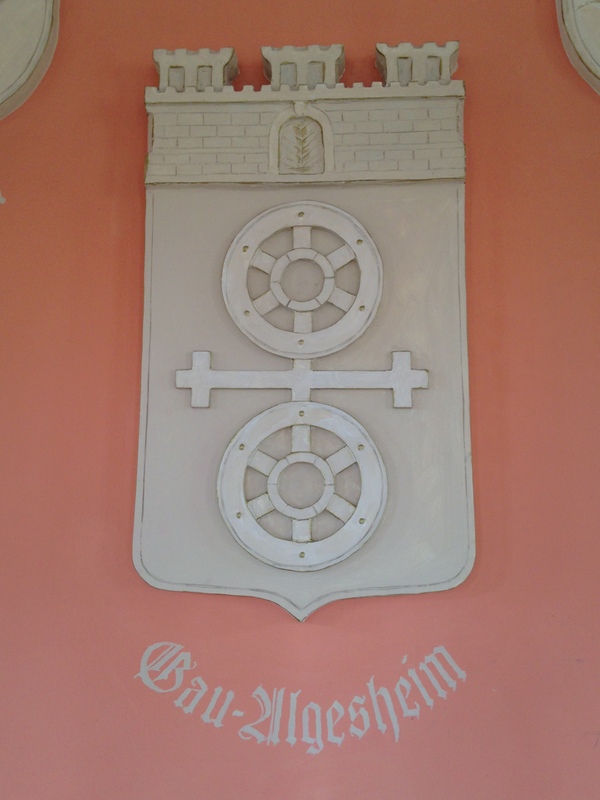 Although originally a Catholic community, after the Reformation Erbes-Budesheim became a predominantly Protestant community. 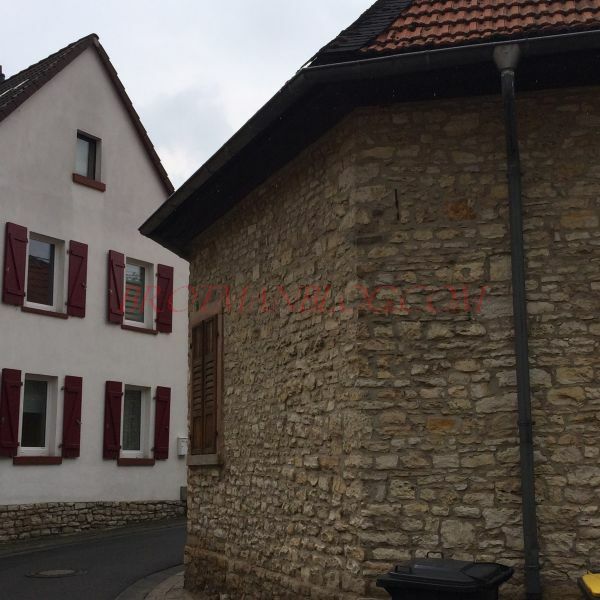 Some sources say that there was a small Jewish community in Erbes-Budesheim as early as the 16th century, but as of 1701, there were only 15 Jews (two families) living in the town. 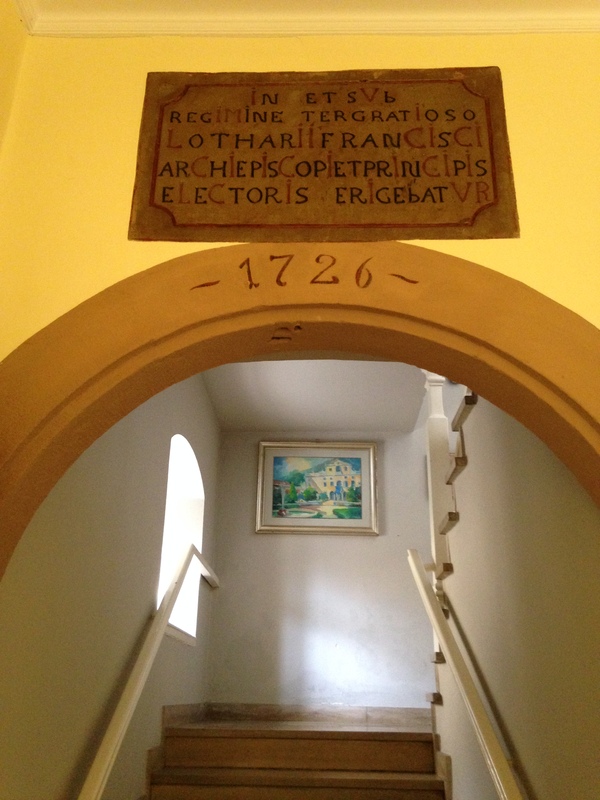 A third family lived there in 1733, but even as late as 1824 and throughout the entire 19th century, the population did not exceed 23 people. 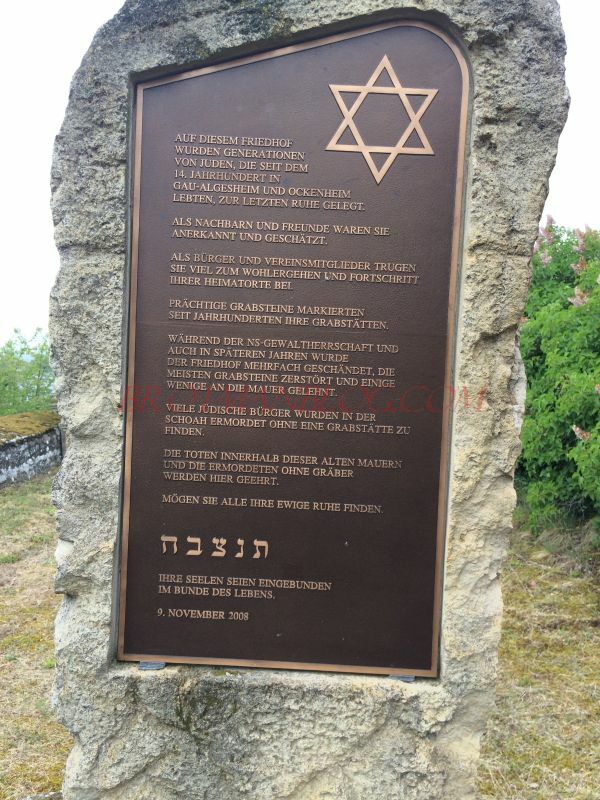 The Jews in Erbes-Budesheim for much of that history joined with Jews from neighboring communities for prayer, education, and burial. 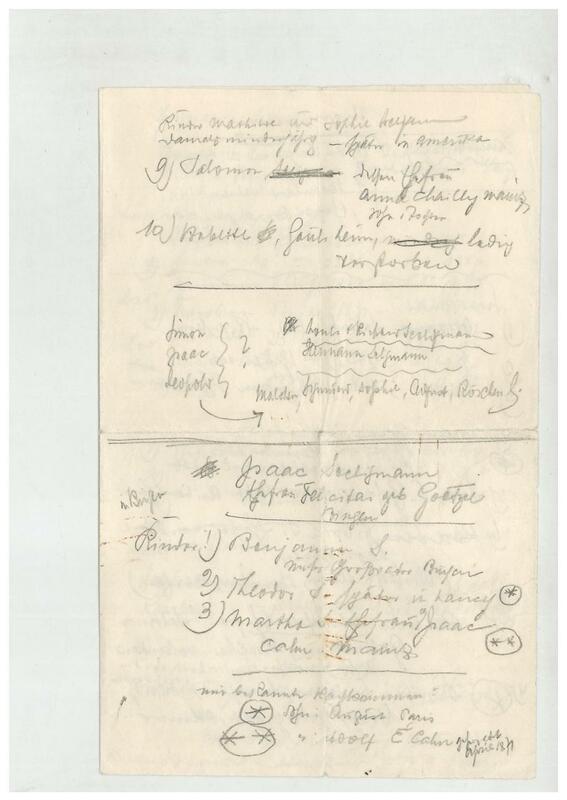 By 1849, however, one Jewish resident named Strauss had dedicated the first floor of his home for prayer services, and it was furnished with the essential elements for a synagogue: Torah scrolls, an ark, a yad, and a shofar, for example. 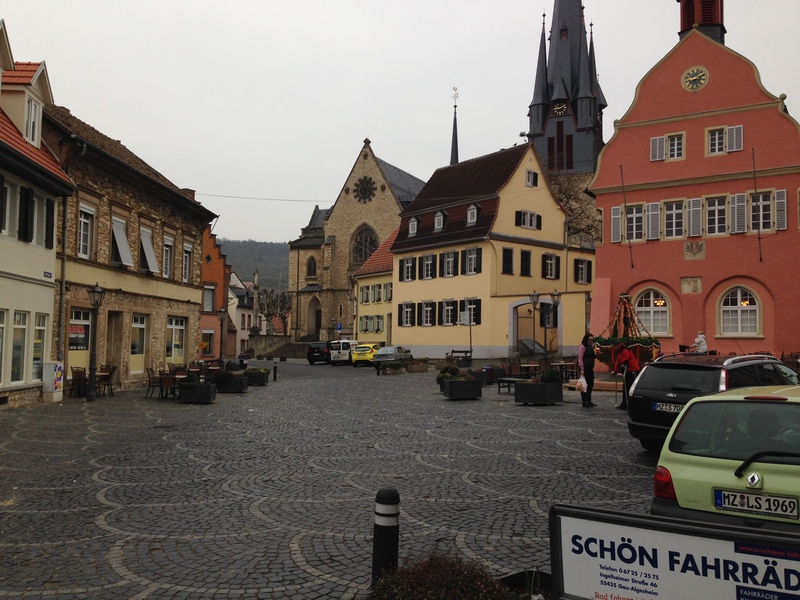 Perhaps this is where my 4-x great-grandfather Bernhard Schoenfeld went to daven [pray] when he and his family lived in Erbes-Budesheim. 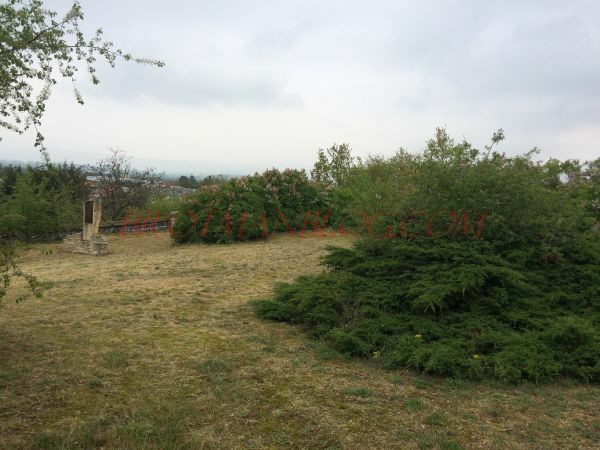 There is also a Jewish cemetery in Erbes-Budesheim. 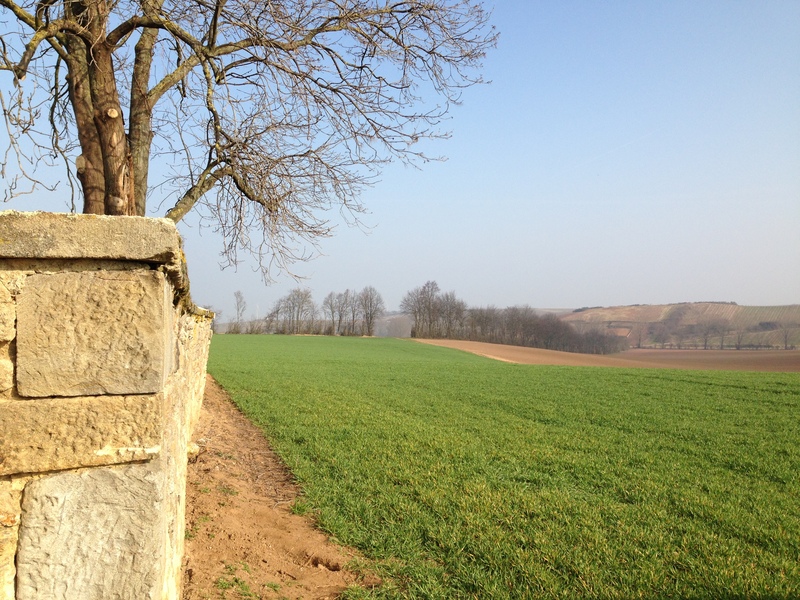 On this video you can some headstones with the name Schoenfeld from the Erbes-Budesheim cemetery. 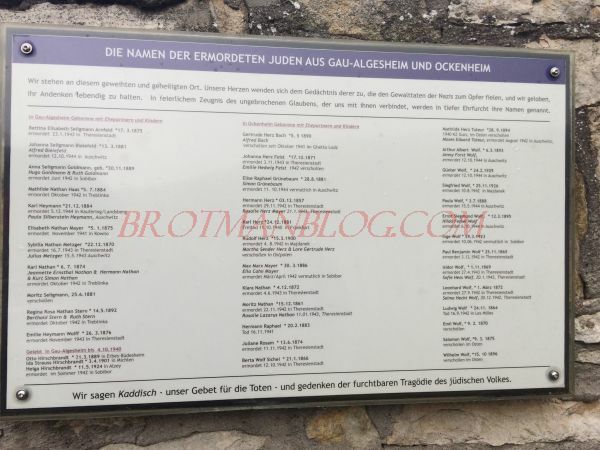 By 1939, there were only eight Jews left in the town, and it would appear from the allemannia-judaica website that none of these survived the Holocaust. 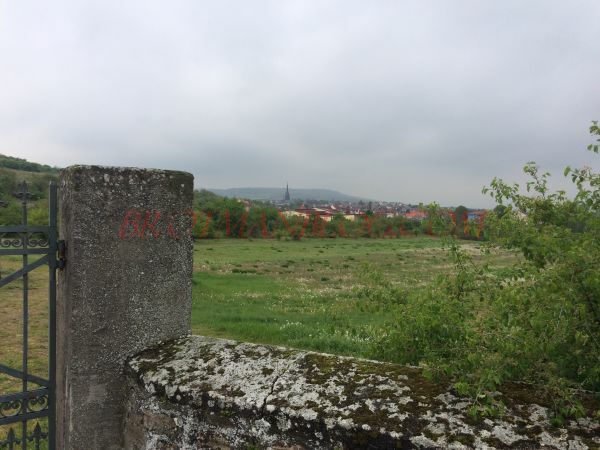 Thus, Erbes-Budesheim was never a place where a substantial Jewish community existed, and it makes me wonder what would have brought my ancestors there. Why would anyone want to be one of a handful of Jews in a community? 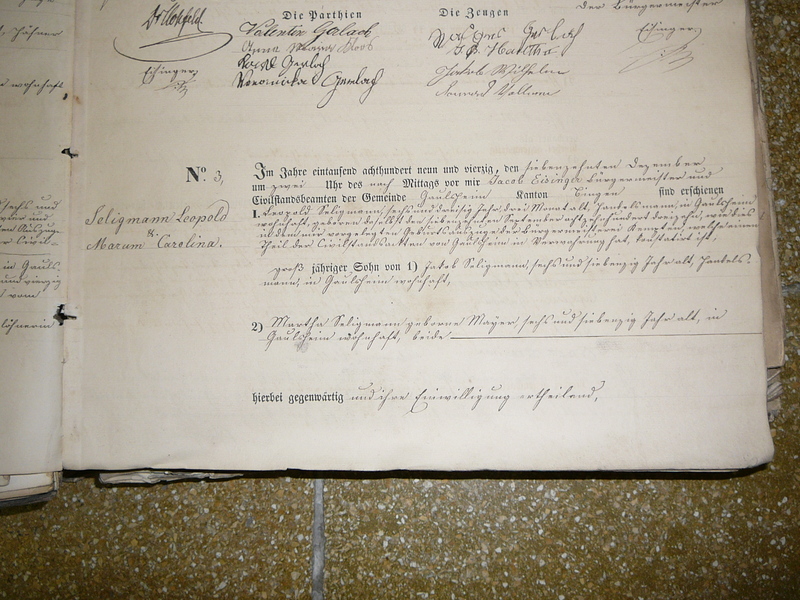 In my next post, I will consider that question and share the documents I received from Erbes-Budesheim.